I don’t know if it’s because I’m getting old (which I am) but, lately it seems like cancer is becoming common around me. Two of my RC buddies, Mike and Elio, have recently beaten cancer, so when I was asked by Elio to attend the Crawl for a Cure, I was all in. 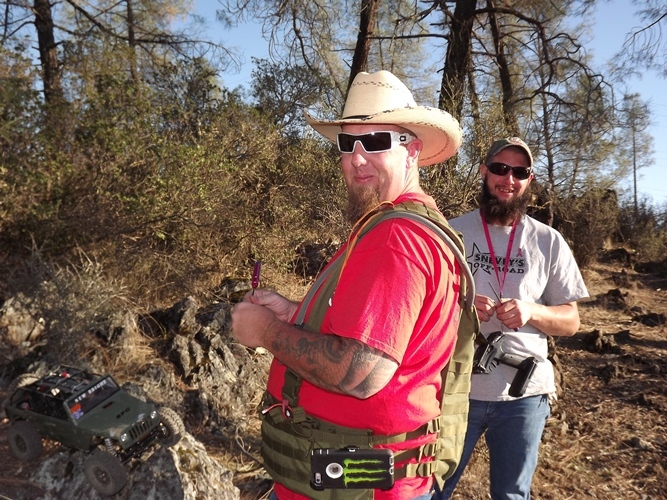 Mike and I packed up our scalers and headed out to Rollins Lake, Grass Valley, California. 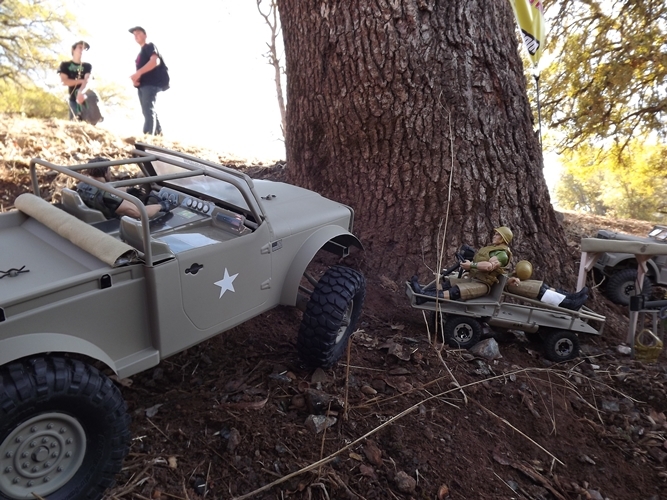 I have been to this lake before for a couple RECON G6 events, so I knew the location was a great one for some fun scale action. I spotted this Samurai as soon as we parked. 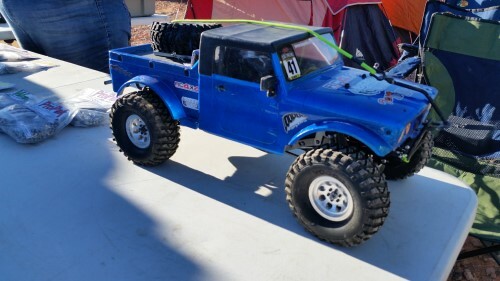 I have a soft spot for small trail rigs, so this one got my attention. 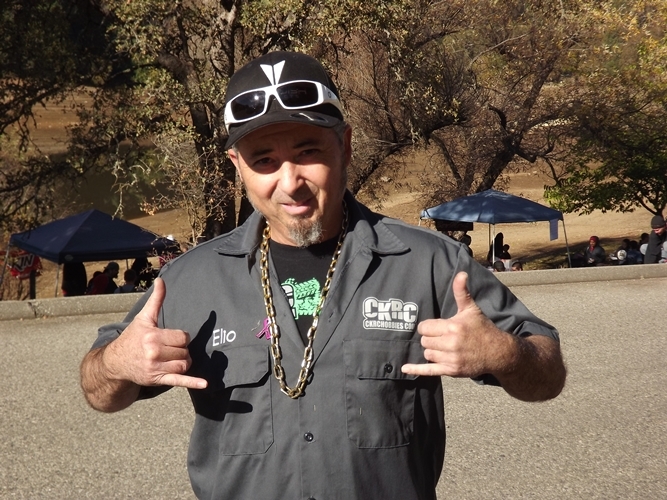 Elio was ready to rock and was sporting his cancer awareness pin. 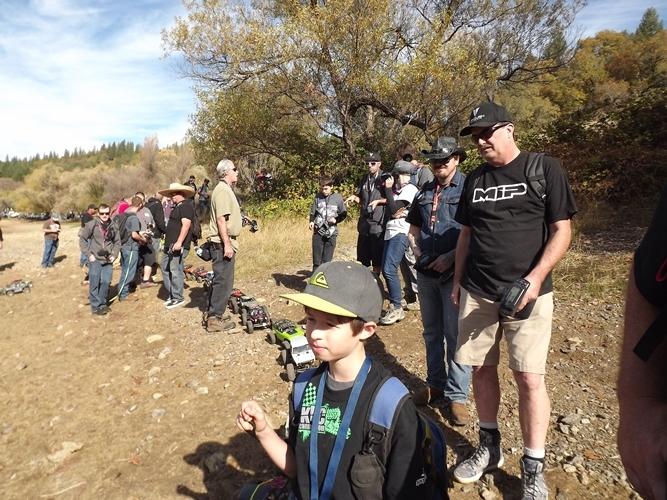 A pretty good crowd was already there and many more were expected as over 100 drivers had preregistered. 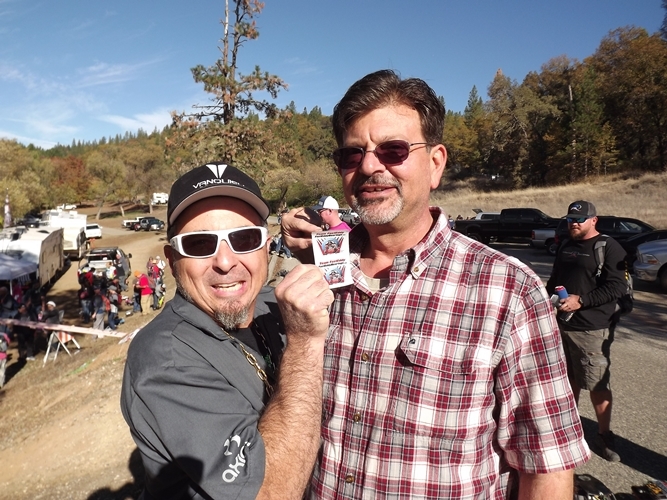 It turned out that 178 drivers showed up to support the Crawl for a Cure event, awesome! 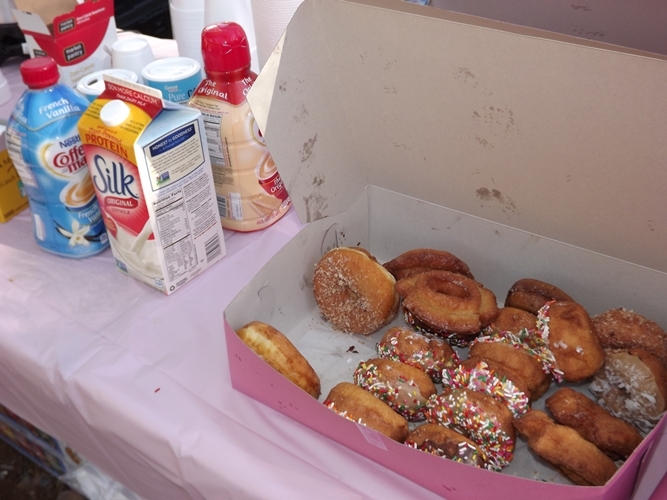 Some coffee and doughnuts were waiting for drivers at the registration booth. Drivers got a great swag bag. 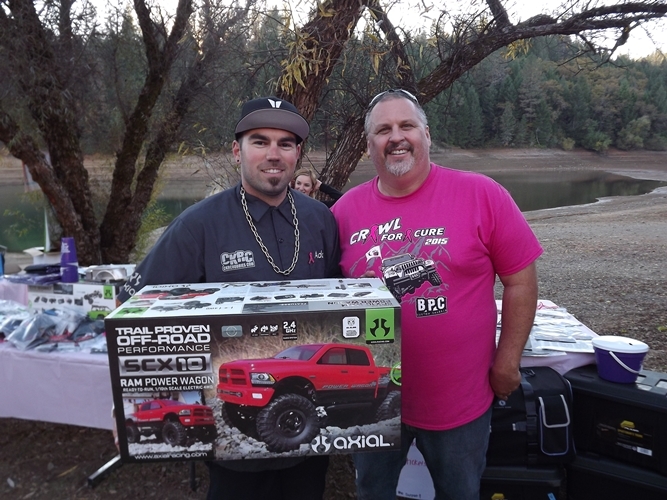 There was a raffle ticket for an Axial SCX10 Dodge Power Wagon as well as a lunch ticket, stickers, Pit Bull coupons, and a sweet 5.5mm wrench. The wrench was my favorite part. It’s now my official brake bleeding wrench. Whomever made/donated these things, thank you. 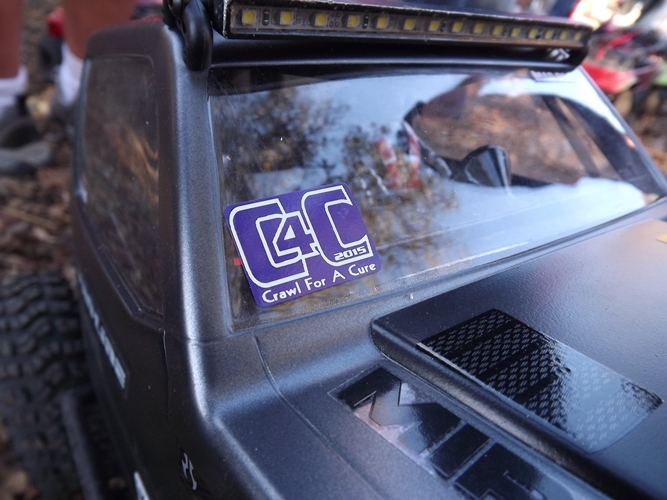 The swag bags also contailed these cool little registration stickers to show you were entered for the C4C event. I spotted a couple trailers that Elio built and donated. He’s been making a lot of these things to keep busy during his recovery. 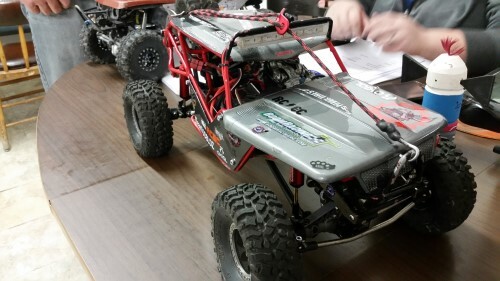 He also donated some to the Axialfest 2015 swag prizes. Did you win one? I wandered a bit before we started and saw these kiddos eagerly waiting. This is one of the best parts of scale adventure; it’s family friendly. TG Squared came out and had samples of their 1:1 and 1:10 leds on display. 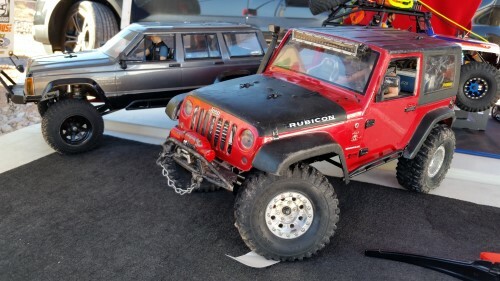 …upon closer inspection it was a Nukizer715/Honcho hybrid. 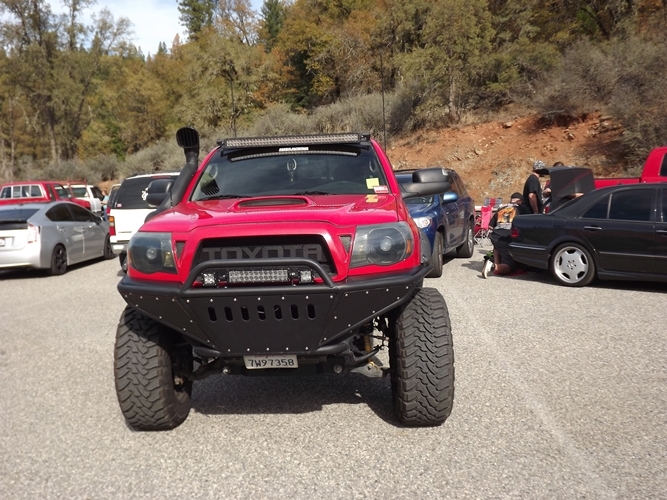 This thing was really cool. 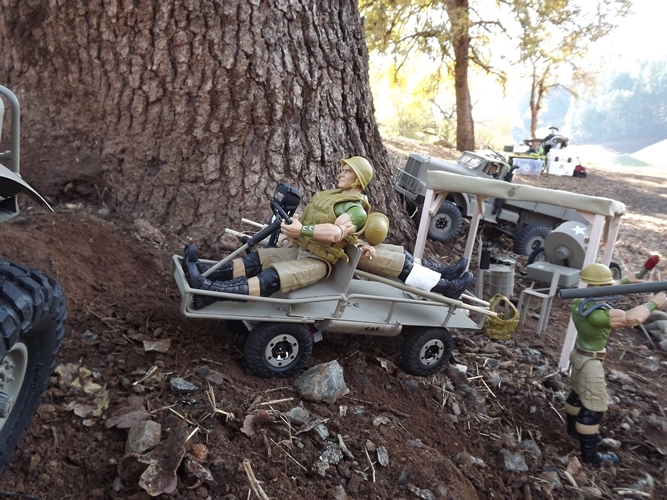 Elio brought out his military gear to display. He built all of these things. 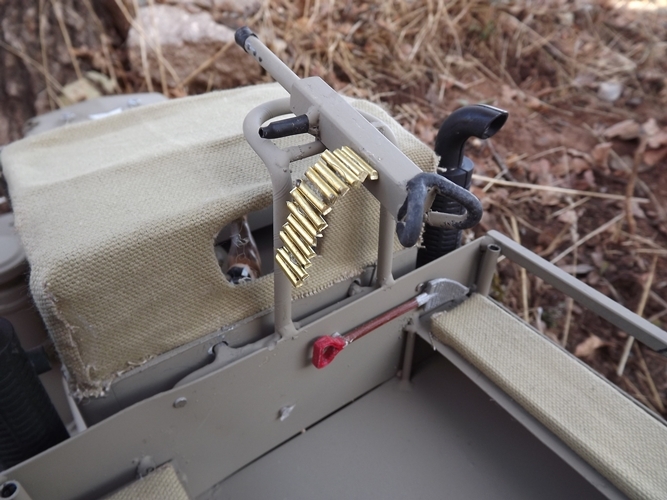 Even the Ma Deuce was hand made. 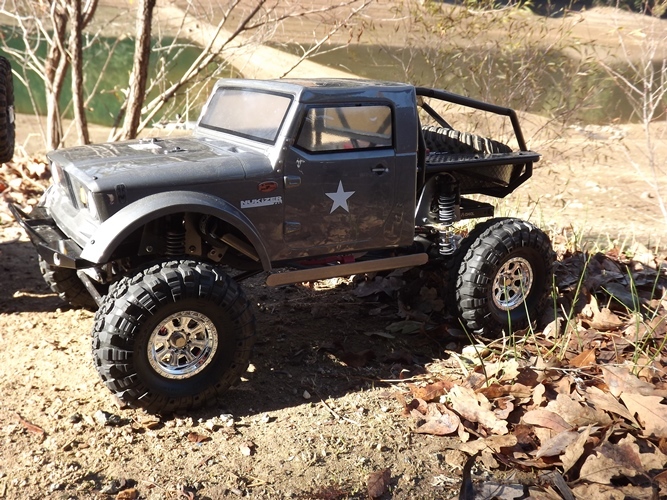 Another Nukizer body was put to use. These bodies were popular. 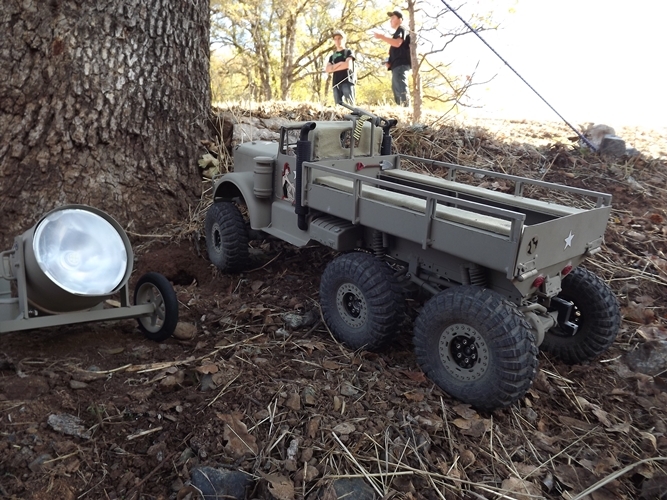 He even built this all terrain military stretcher called the Mule, are you kidding me? King of Scale, indeed. Elio seemed to be everywhere. Here he was harrassing Fast Eddy from Fast Eddy’s Bearings. This was a change, since Eddy is usually the one doing the heckling. The crowd kept growing. 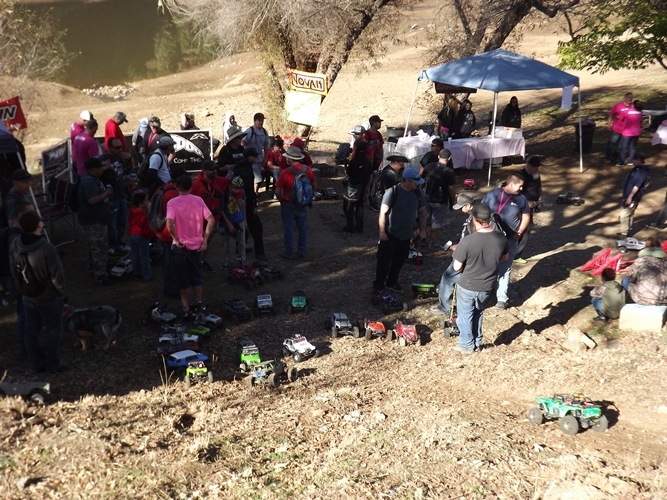 Did I mention 178 drivers showed up? 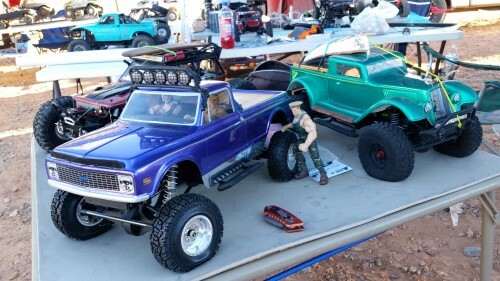 Rigs were lined up in anticipation. Hey, look, another NuKizer back there. Soon Mark Bettencourt got on the mic, and we got this party started. The trail led us down towards the water’s edge. My RECON G6 Deadbolt worked flawlessly as always. Lines were a little thick at the start. 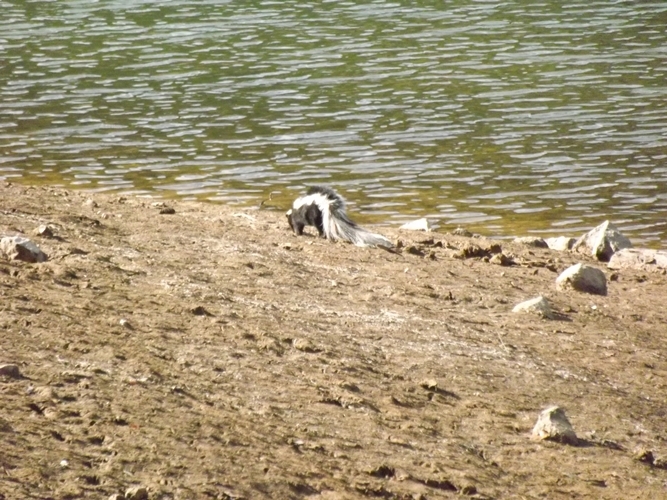 I think people were distracted by this cat playing down by the water. This guy wanted to pet it, but his dad told him that stray cats were dangerous. Here’s my RG6 Deadbolt rolling through some Autumn leaves. It’s always good to see the ladies out scaling. Pink and Green dropping in. The color combo actually worked really well. There’s that cat again. Wait a minute, that’s not a cat. 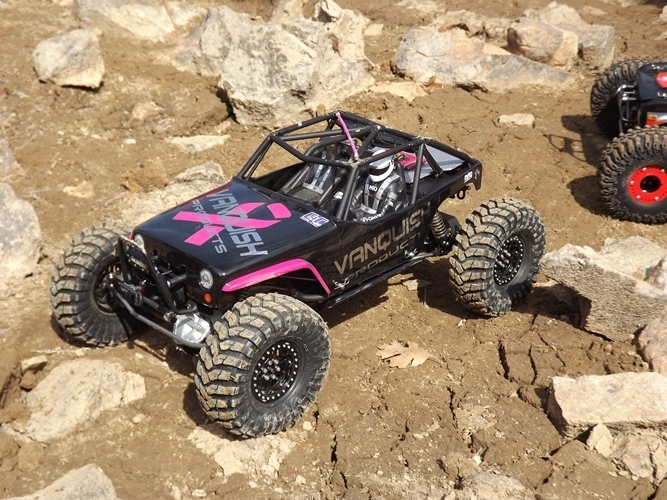 Adam Dean was out running the Vanquish Wraith he won at Axialfest 2015. It was looking good in the pink and black. 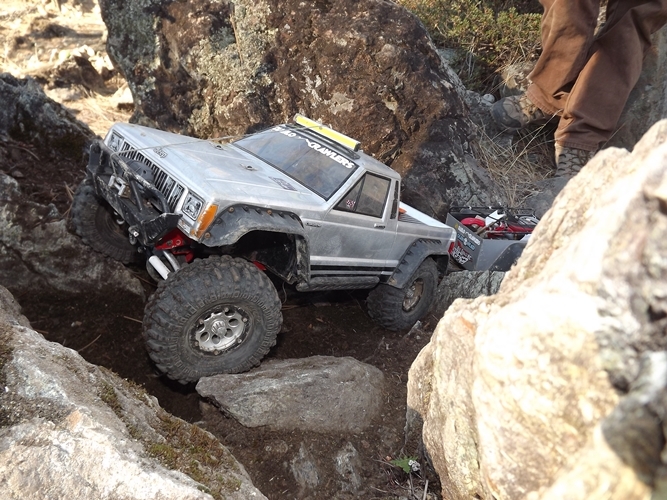 Mike busted out his Wraith Spawn for it’s inaqural run. He was impressed with it’s performance. This was a big drop off this ledge. It made driving smartly important. It was nice to see siblings out having fun together and not fighting. They were rocking those pink ribbons. 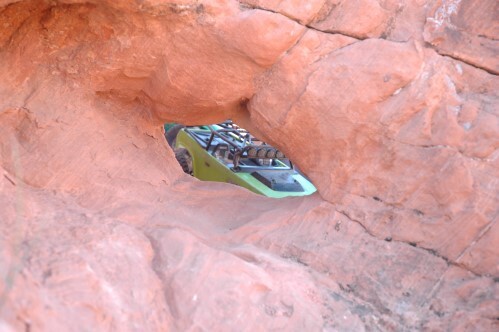 This Deadbolt driver seemed a little nervous about this climb. Can you see the two handed death grip on the steering wheel? Since Mike and I were driving in the fun run, and not scored class, we decided to take a lunch break and let the lines disipate a bit. 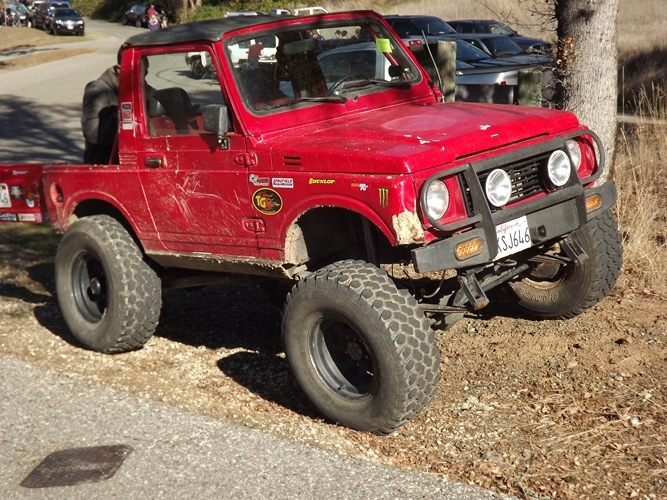 I spotted this beast on the way to the car, overland ready. 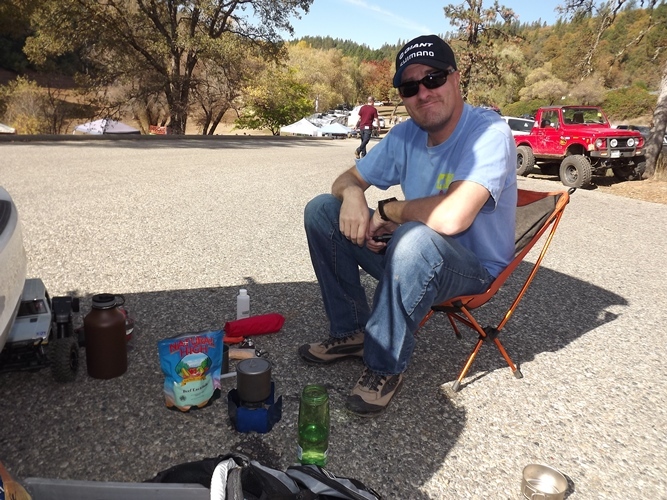 Mike and I busted out our adventure stoves and cooked up some fine Mountain House meals. Hey look, there’s that Samurai hiding behind Mike. After lunch, we headed back out. 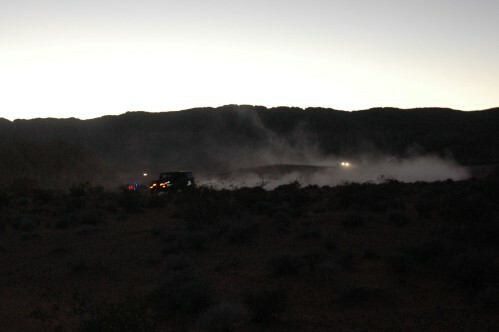 Here we ran into a crew running their Wraiths. We also saw this grandfather putting a schooling on his grandkids. His granddaughter did her best to keep up. This young guy stopped to pose with his Jeep. I could have used a drink from that cooler. 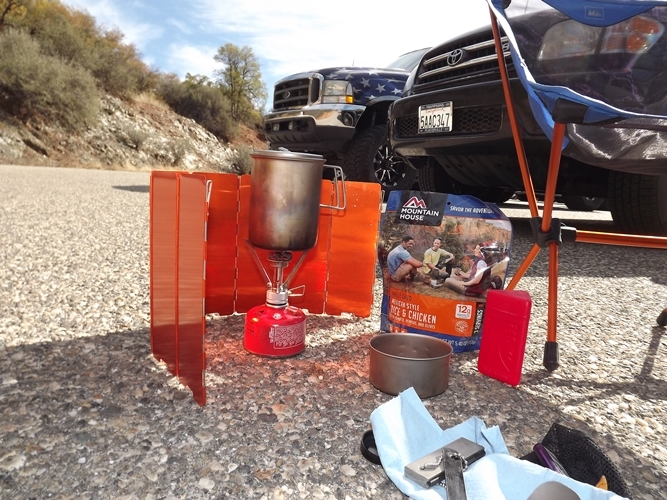 I used all my water making Mountain House meals. These two were stopped for a little trail repair. 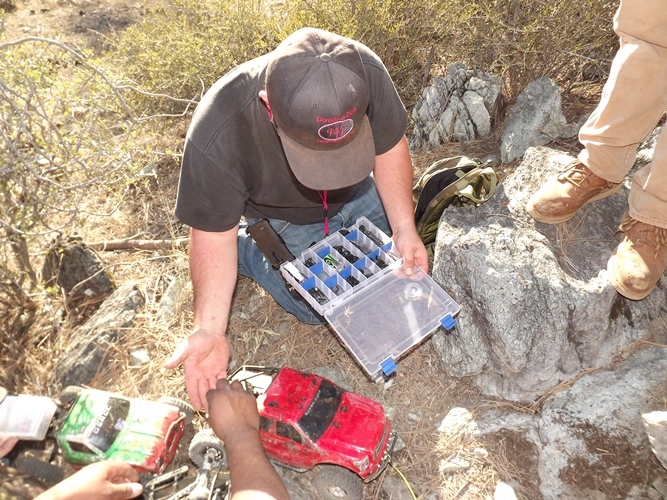 That’s why it’s important to bring your tools and parts out on the trail. 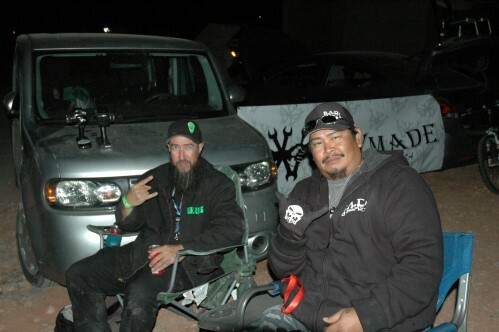 After several hours of driving, some of the particpants took any opportunity to rest as they could. 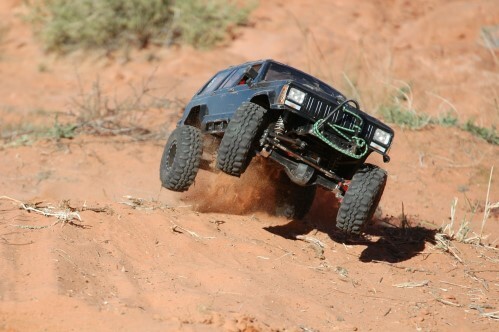 The Comanche is one of my favorite bodies. 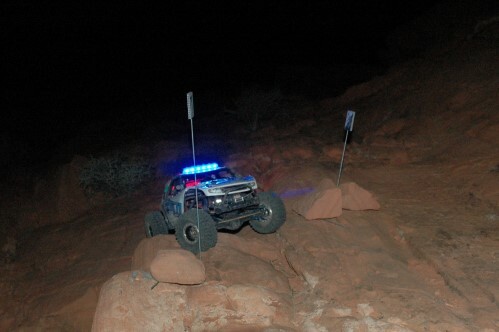 It looked good running the Dingo flares. This crew wasn’t messing around. They brought a whole screw kit along. I told you the trail was long. 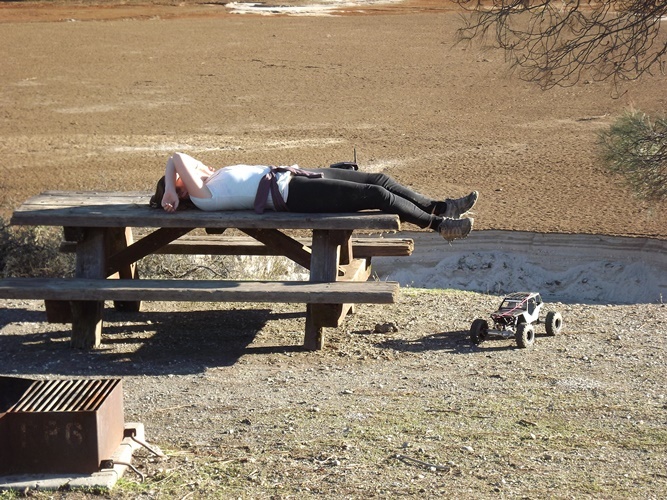 This lady grapped a quick cat nap before completing her run. 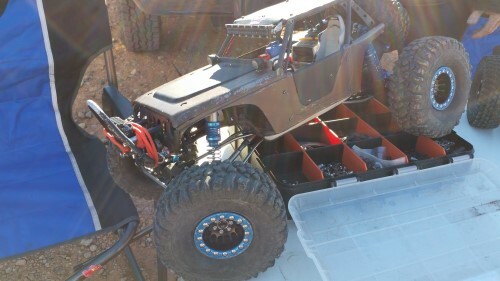 Oh my, are those new Vanquish axles? 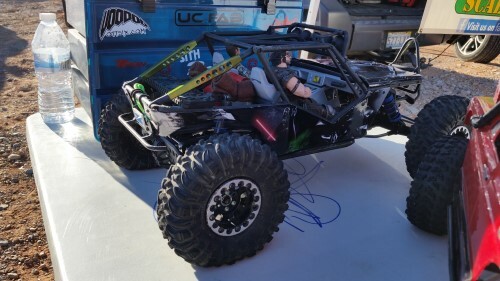 This EXO buggy was sporting some Axialfest 2015 livery. I had to put this guy’s picture in because I made him squat down and pose for this picture. The Cables of Carnage made a return. I haven’t seen these since the Axial West Coast Championships. Oh, sweet memories. 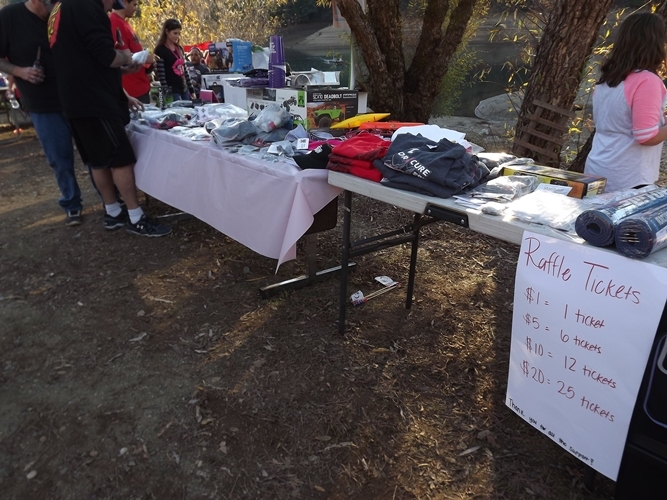 The raffle booth was busy selling tickets. And for good reason. 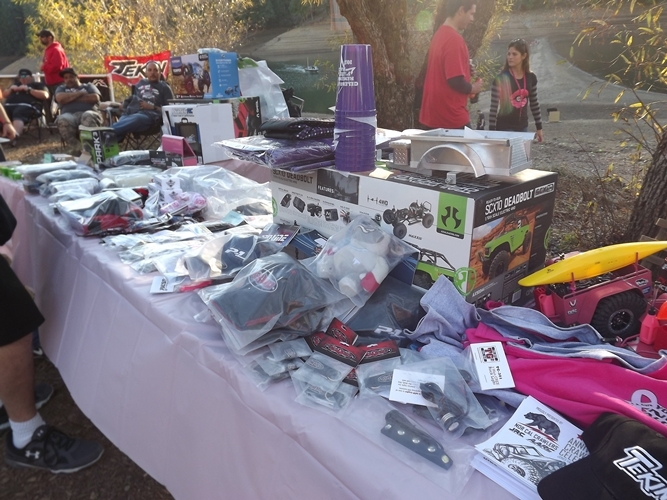 There was tons of sweet prizes. 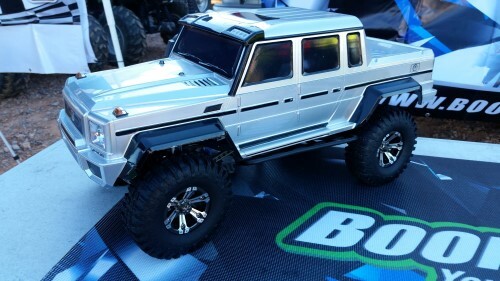 I had my eye on those Freq-E-Skinz P40 Warhawk Wraith Wraps, and I don’t even have a Wraith. They were just really cool. 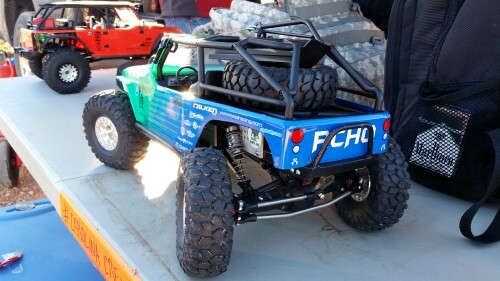 I was digging this Mighty FC Jeep. 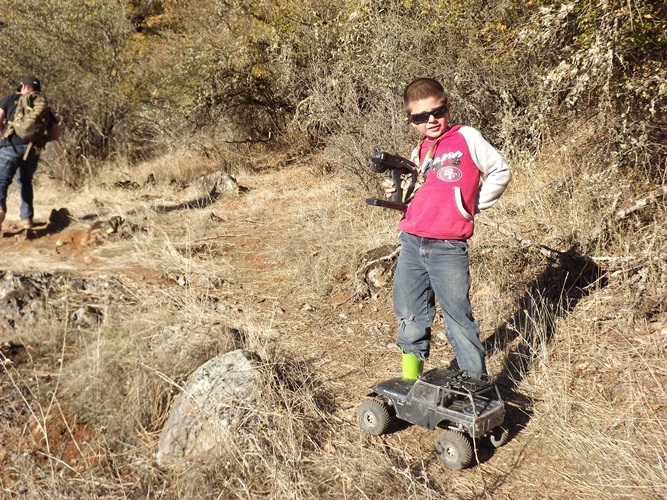 I might need to add training wheels to mine. 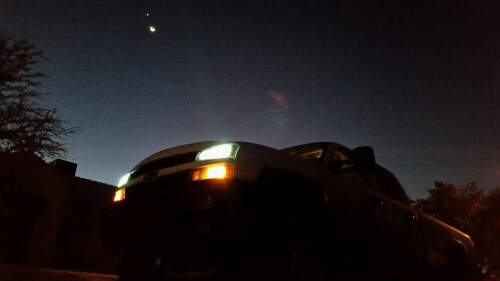 The 2.2s look good on there. 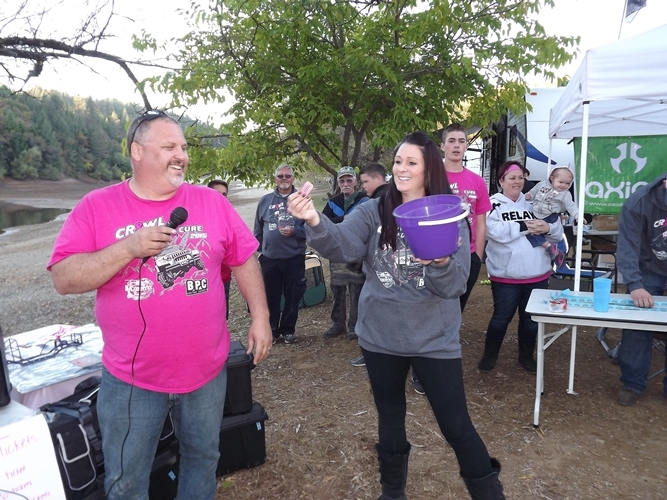 As drivers finished, we all awaited the raffle. 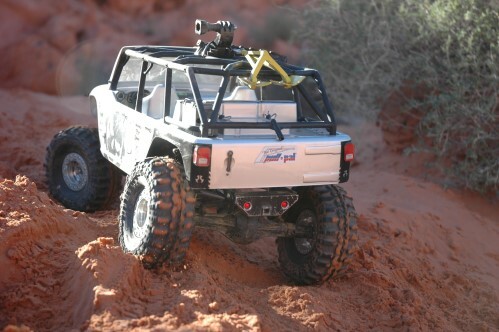 Mr. Bettencourt started with the Axial SCX10 Power Wagon. 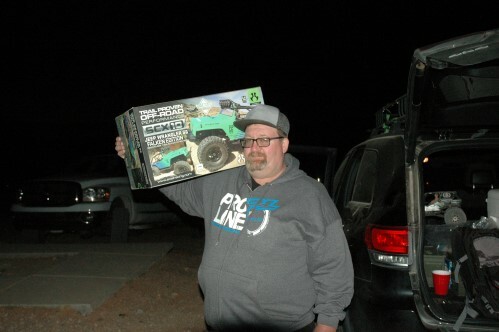 Adam Dean was the lucky winner. I rubbed my raffle tickets on him. He’s one lucky guy. 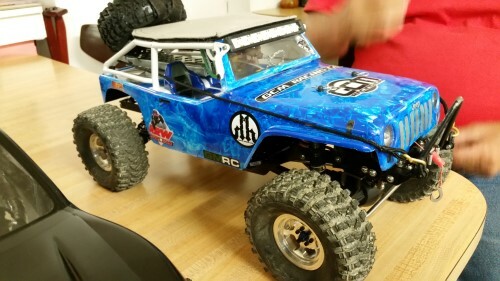 He also won the Vanquish Wraith at Axialfest 2015. 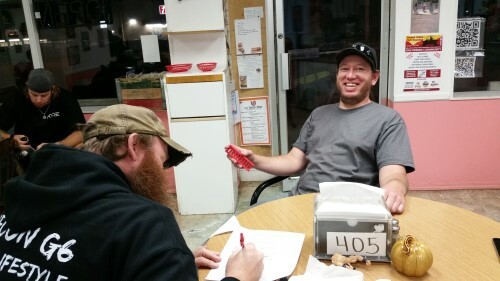 Everyone started checking their tickets as the raffle got under way. 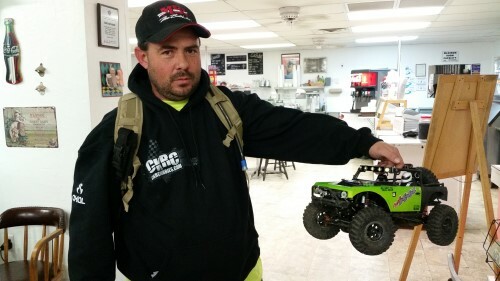 This guy scored a sweet mini EXO from Hoyfab. Even came with a scale radio, what? These two nervously checked their tickets. 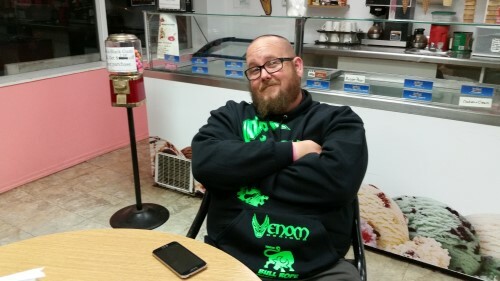 He was one of the lucky Pink Zonkerd Trailer winners. This youngen was the winner of the other C4C Zonkerd Trailer. 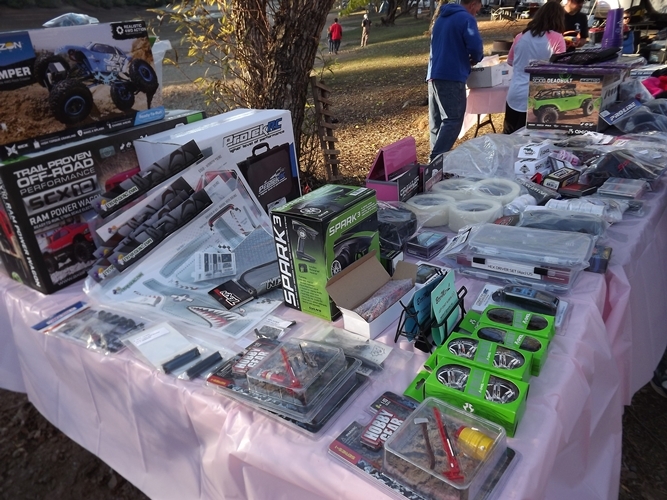 With the huge turnout, the 2015 Crawl for a Cure was a big success. Lots of fun was had while raising money for the American Cancer Society. If you didn’t make it this year, make sure you add to your calendar of events for 2016. Next year will be even bigger and better. In 2007, my close friend (Carmen) was diagnosed with Breast Cancer. At the time, she was 37 years old, only 1 year younger than myself. She was a mother to 3 boys (Fabian – then 12 years old; Daniel – then 8 years old and Aidan – then only 1 years old). She was diagnosed as borderline stage 2-3 and the doctors felt that her cancer was advanced which they forecasted her to live approximately 2 years. Carmen’s will to live and fight had other plans. Even though Carmen’s cancer spread, Carmen would not give in, she refused to be a “cancer patient”. During her nearly 9 years of battling cancer, Carmen endured years of surgeries, radiation, chemotherapy and various drugs all with the goal of treating her cancer and hoping to be “cured”. Immediately upon learning of Carmen’s cancer diagnosis, we all immediately wanted to know, what can we do to help. I had never attended a Relay for Life event, but I had seen the purple ribbons in town, saw the posters in various store windows and I knew that this was a cause I wanted to be a part of. Team WFAC (Walking for a Cure) was formed. Our first year, we had no idea what we were doing, but just being a part of cause and event that focused on all of the things that we were so passionate about was comforting. 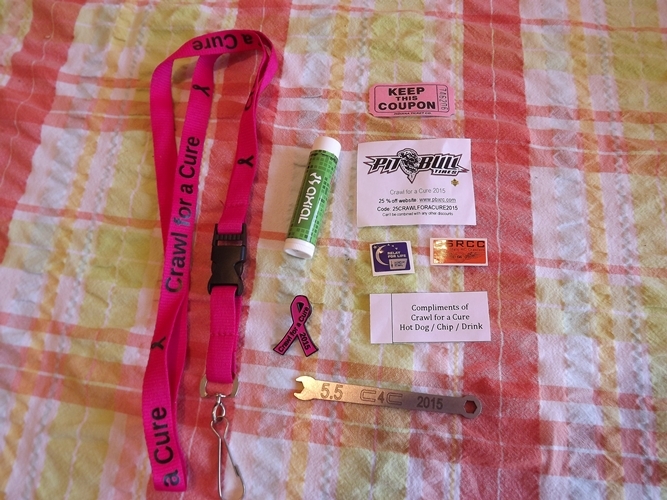 We have participated in American Cancer Society, Relay for Life every year since. 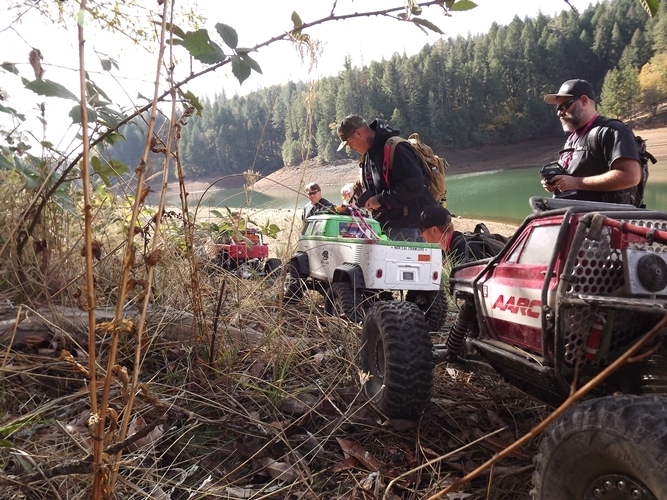 We have helped raised (Team WFAC) more than $100,000 in 9 years. This was all done by donations from family and friends and team fundraising events. 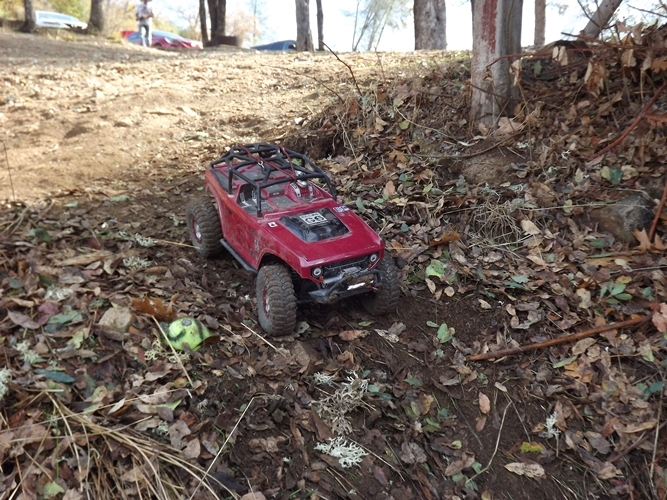 My husband (Mark Bettencourt) wanted to find a way to expand the awareness of Relay for Life (American Cancer Society) and his favorite past time (RC Rock Crawling). 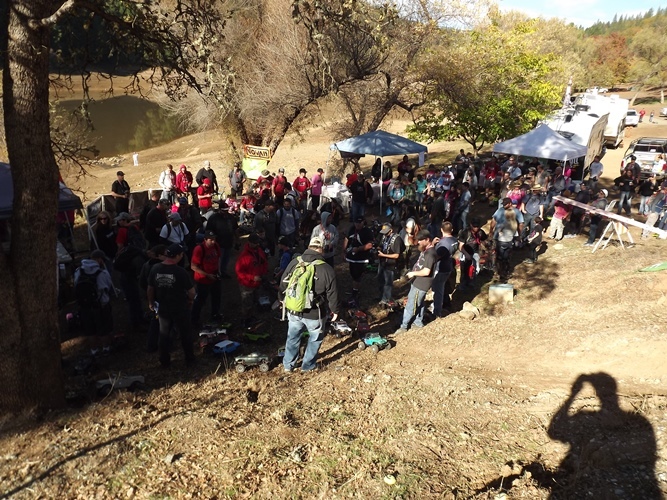 In 2013, we held our first event (Crawl for a Cure). We had no idea what kind of participation or interest we would have. Our first year exceeded our expectation. We met cancer survivors, caregivers and heard many stories of people who like ourselves had been touched by Cancer. Everyone helped us to raise money but more importantly we formed a bond not only over our favorite past time, but how so many of us had common cancer stories and how we all wanted to help. We have continued the event and are in our 3rd year. Every year we reach more people that want to be a part of this event. 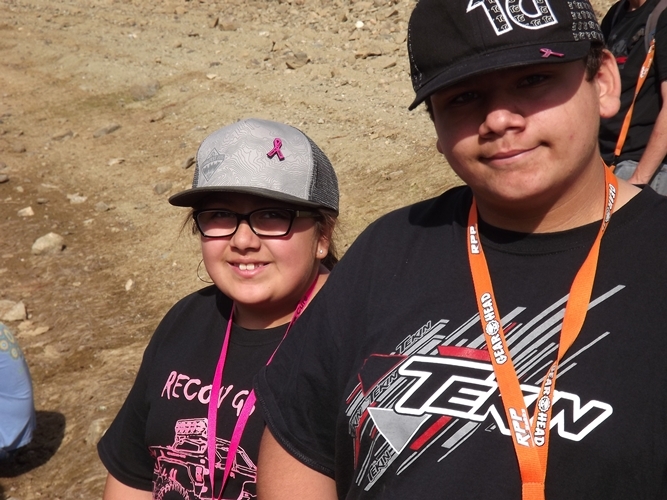 Last year we had approximately 150 drivers who participated in this event and we raised $5,000. Again, thank you for your interest in our event. 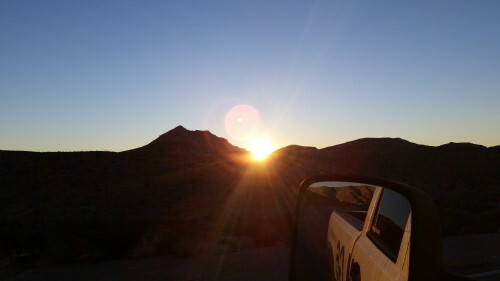 Good morning, it’s 4:50 a.m. and I am about to head out to a now familiar spot. 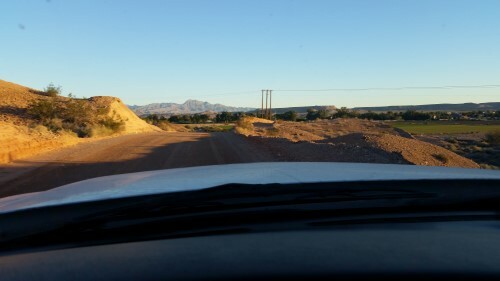 I am heading to Logandale, Nevada for a triple header of events. 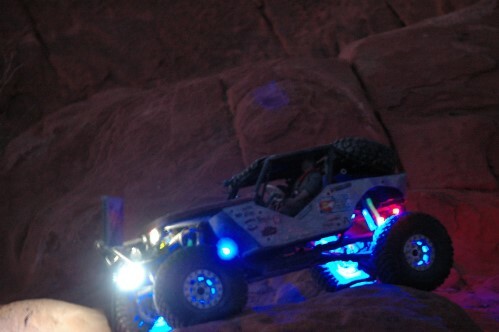 “The FIX” 12 hour endurance event, The Straight Outta Luck RECON G6, and the The Hump-N-Bump 1:1 event will also be going on. 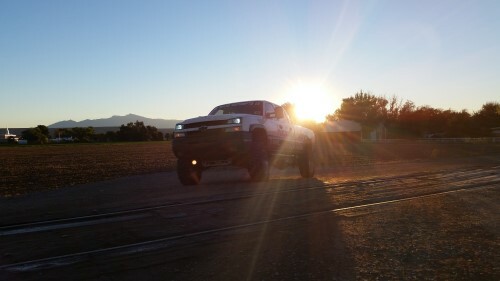 So let’s head for the highway and put some miles behind us. Its a bout 50 minutes to the location. 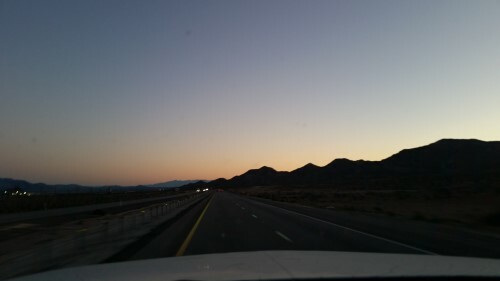 Now on Interstate 15 the sun is starting to come up. 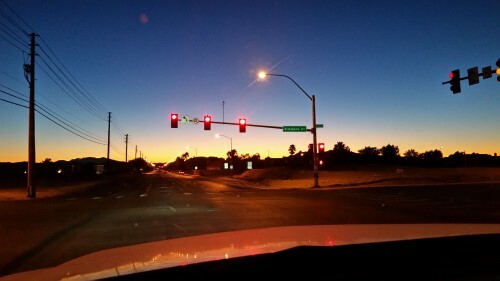 People may not come to Las Vegas for the sunrise, but it’s a nice change of pace from the lights of the city. Now at the Logandale trails road, it’s only about 10 minutes. 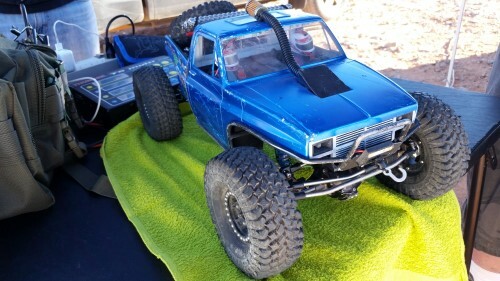 I am very excited to go see some RC trucks. Looks like the city even did some maintenance to the road. Next stop will be the pit tables for these two events. 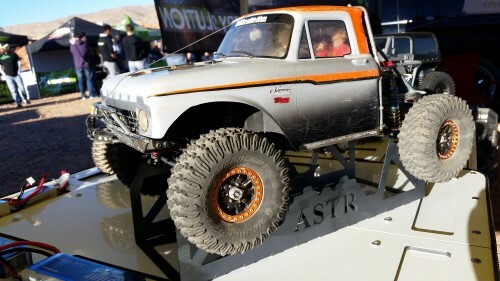 Axial Yeti Score Trophy Truck on display here, but check out the old school Ford with the Baja look in the back ground. 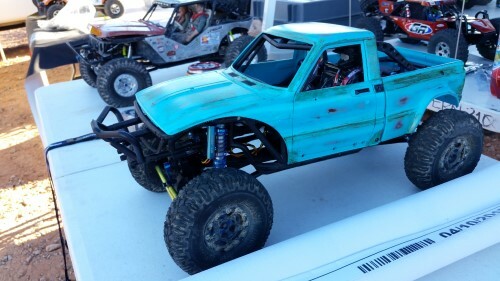 Pretty cool rig by Cody Knoll of Reno. 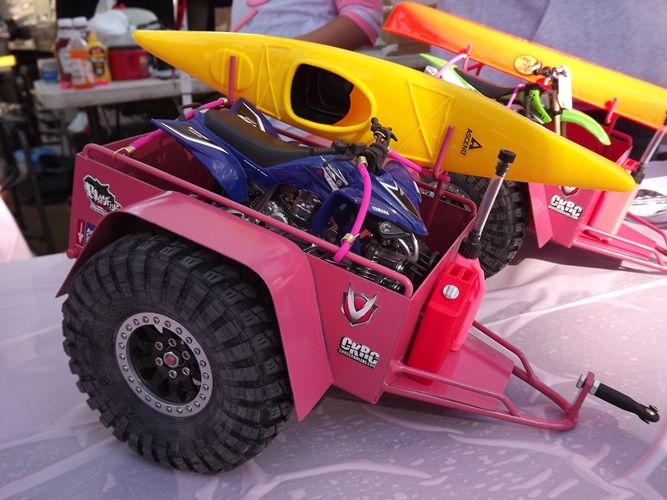 Would you put this through a 12 hour endurance test? 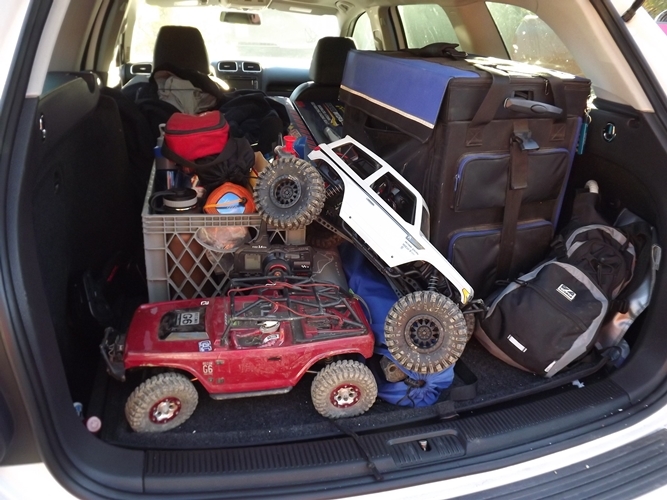 There is always a Jeep Cherokee or two. I really like the K rails; these are even made of concrete. 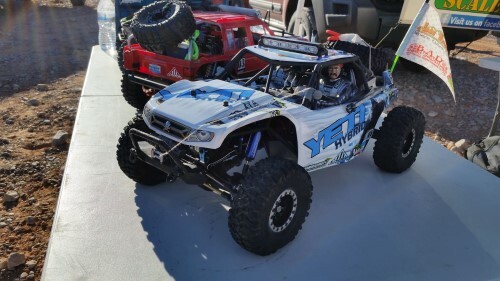 There is always an Axial Yeti in the group. 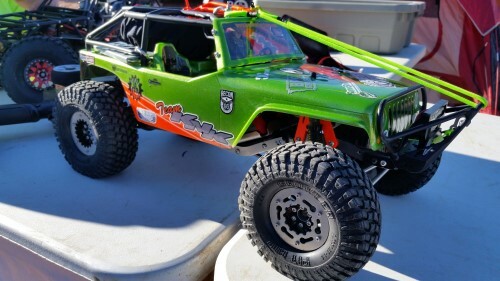 This tubed Wraith pictured above came out all the way from New Jersey. 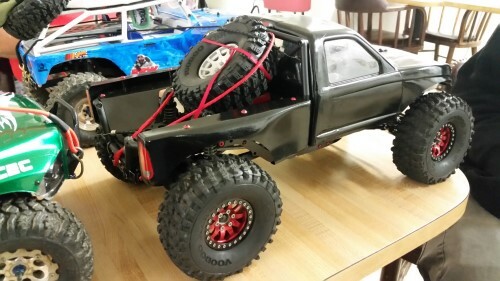 How about using an Exo Terra cage on a chassis? 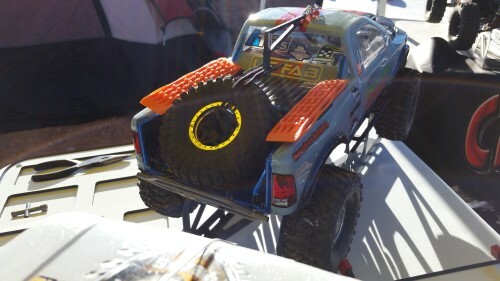 This truck pictured above is built by Trevor. 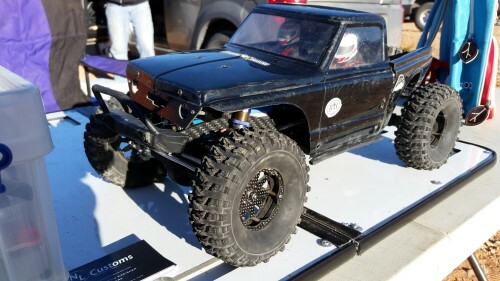 I found this Axial Yeti bodied Hybrid to be an intriguing build. 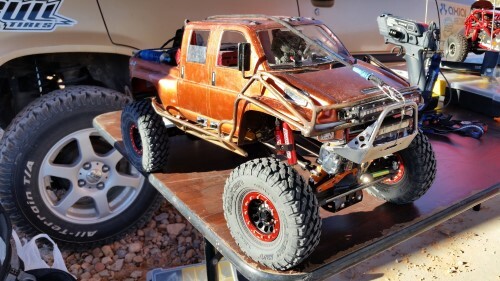 A Yeti body built on a chassis with SCX10 axles and check out that driver. 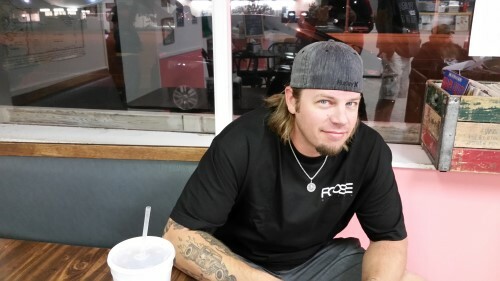 Anybody recognize him? 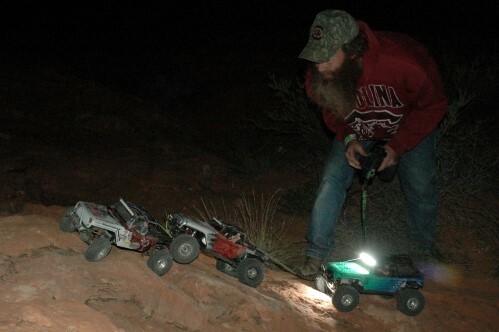 A lot of these drivers came prepared for what ever the trail would throw at them. 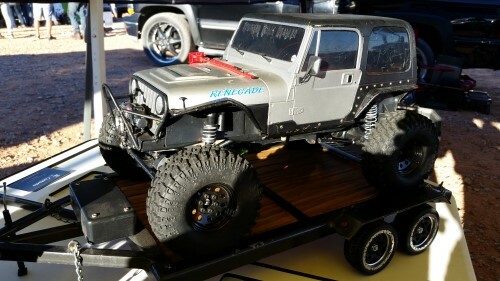 This Axial Jeep G6 showing up with four wheel steering. Pictured above is a heavily built Axial DeadBolt. 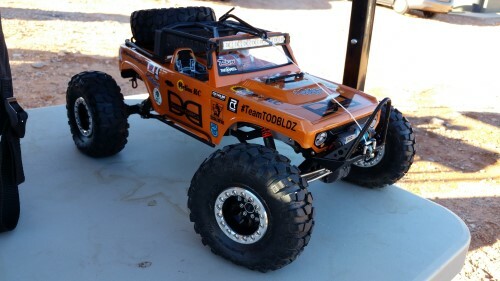 This belongs to Todd Knopp. I also want to congratulate Todd and his now wife Christina. They got married this week while in Vegas. 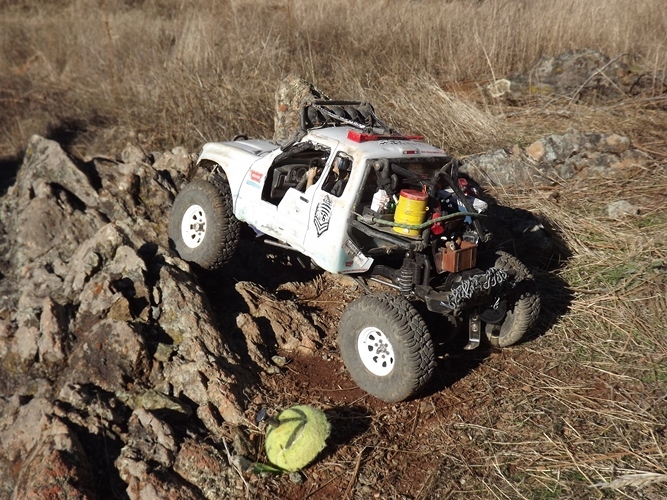 This Axial Jeep G6 pictured above belongs to Story Rice from North Carolina and it looks like he will be running the 12 hour endurance with 1.55 tires. 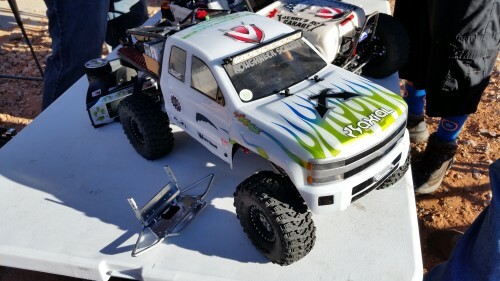 If you’re on any social media sites you may recognize this truck, this is an Ikaika Farrior build out of Aurora, Colorado. What’s interesting is it seems like a week ago this truck was built and looked brand new. He must have really pushed it on his shakedown run. 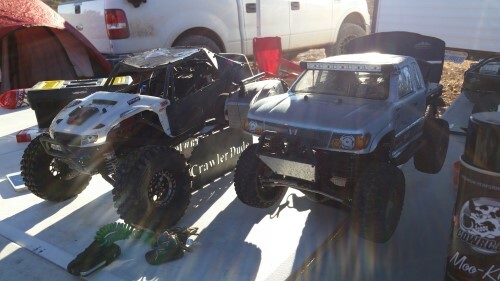 Many of these trucks showing up with required recovery gear to take on the 12 hour endurance. This Chevy had real wood on the bed and leather interior, someone has some crafting skills. Lyle Lyddon of Las Vegas. Some of these trucks look very familiar to me. 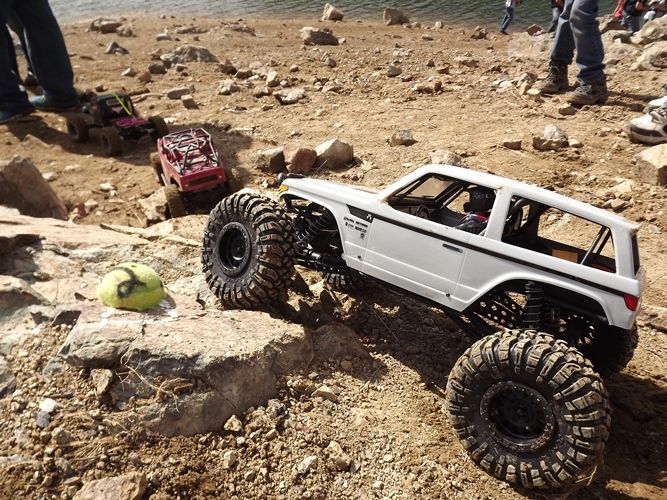 Like this 1.9 Axial Wraith from Colorado Out Cast Crawler Ryan Tousley. 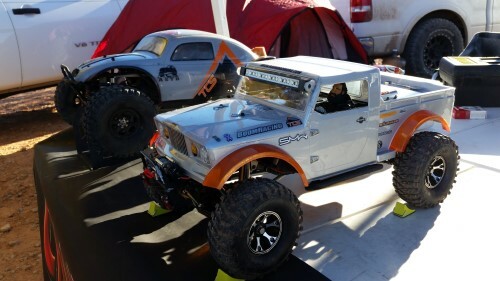 I saw it at last night’s Tech Inspection that went down in Overton, Nevada. 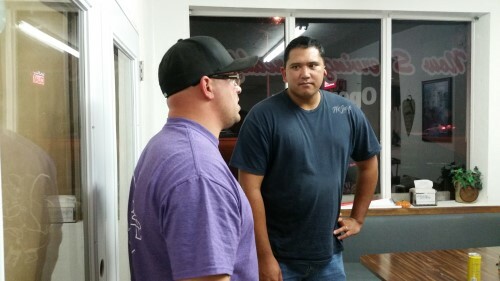 This was an opportunity for drivers to meet each other and check out rigs. 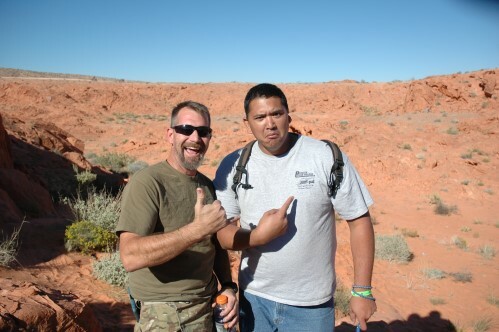 Like Trevor out from Vermont meeting Tatum Bautista here all the way from Hawaii. 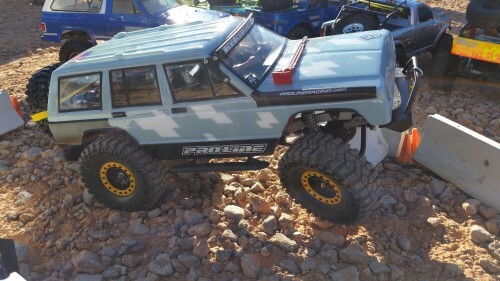 Although this Axial Honcho is a different color than I remember, I do remember seeing it in Florida at the Killer Clowns Axial RECON G6. 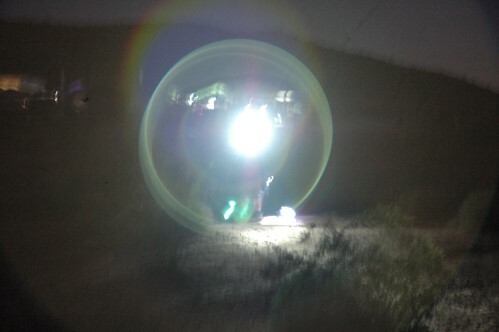 Check out the blog for that event and see if you can spot it. This event is about to get underway. Parker gives some driver instructions and lets these guys know what awaits them. 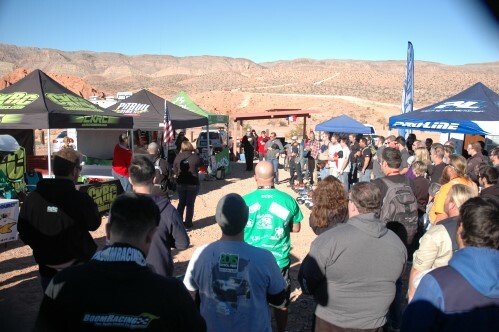 Every RECON G6 starts with the National Anthem, but these drivers received a special treat. Jessica Wright of California sang the National Anthem and thats always a treat! At the first Trail Marker it’s Cole Bailey, a three time endurance driver, including the first eighteen hour endurance event. 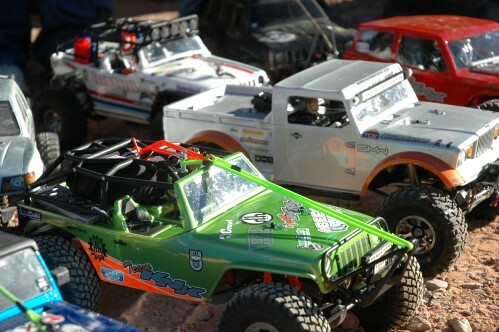 The 1:1 jeeps have lined up for their run as well. 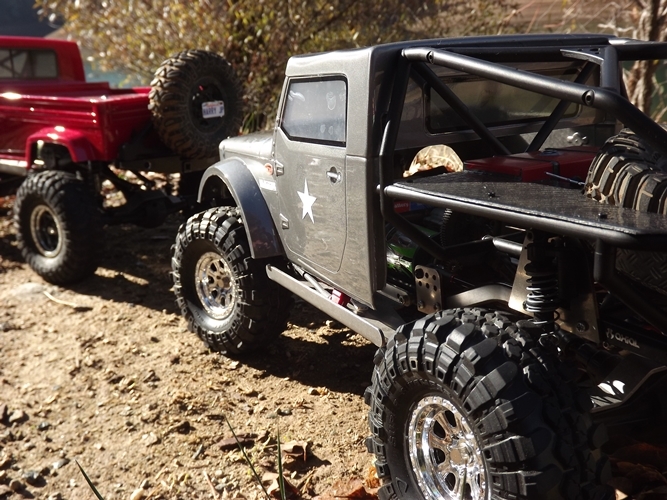 Pictured below is the Axial DeadBolt belonging to Josh Harris from Arkansas. 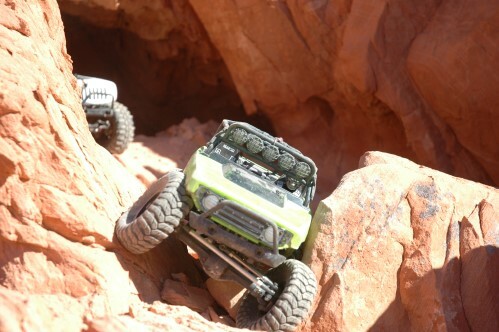 The Axial Jeep Nukizer body sure looks right at home on the rocks. 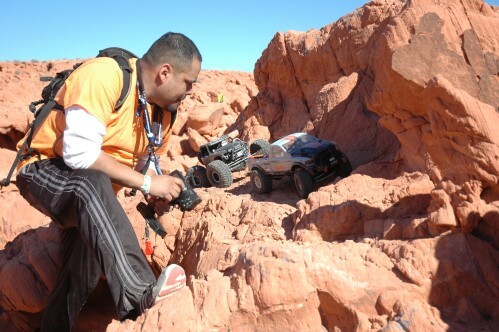 Above drivers really watching and picking their lines in this terrain. 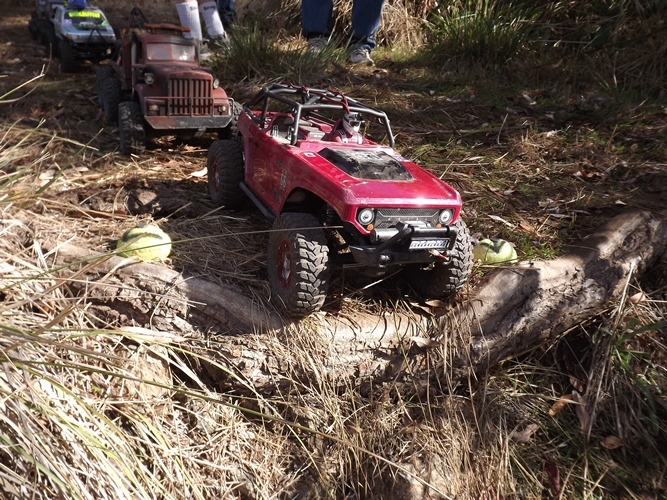 Below some of the Jeepers stopped to watch these RC drivers navigate the terrain and I spotted this right hand drive jeep following behind a Jeep recovery vehicle. The Logandale sand can be fun, but it’s never your friend. Trail Marker on the right, Trail Marker on the left, this is what you have to work with. 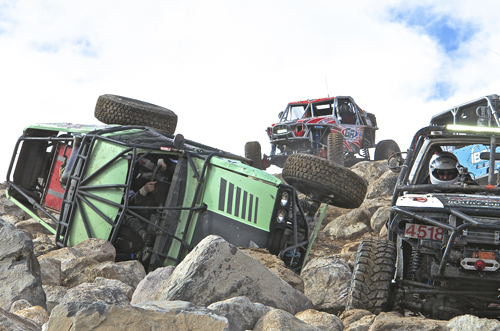 These Dodge Rams stayed together to tackle the terrain. 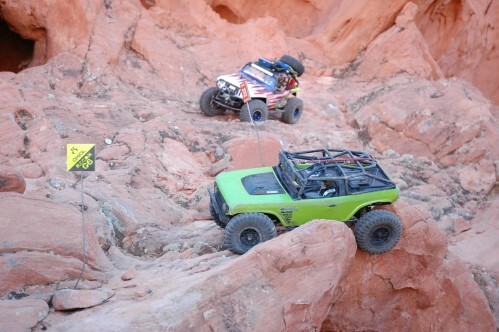 If you weren’t teamed up, some spots had you pulling cable or sand ramps. 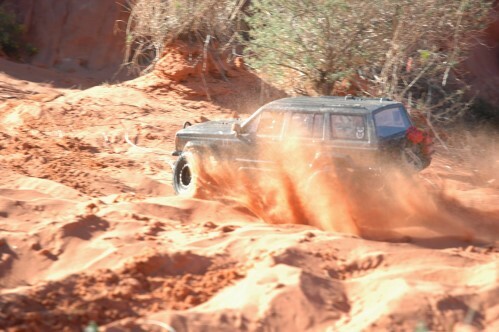 This is Arizona Ford back for more Logandale Trails. 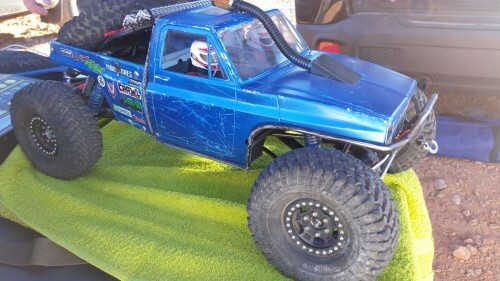 This truck is also in the RC ORVA Worlds 2015 blog if you want to check it out. 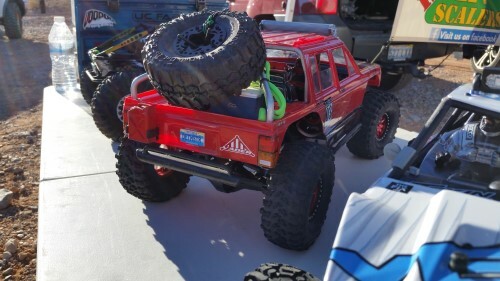 Earlier I had said this was a Jeep recovery vehicle and I am sure that sparks a debate on both sides. 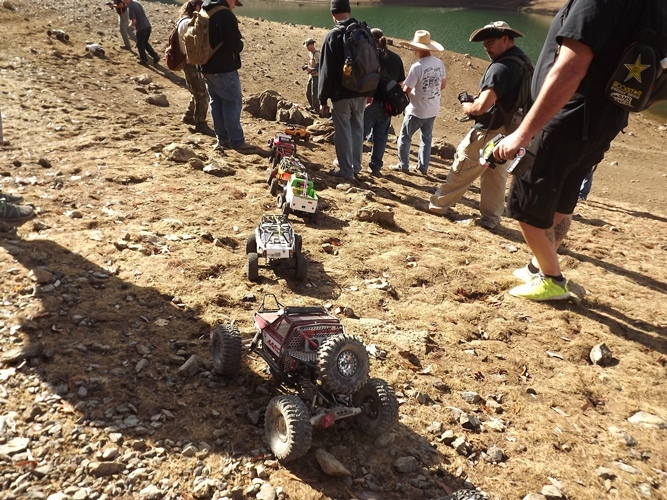 Well in this event every make and model was put to the test on it’s towing capabilities. 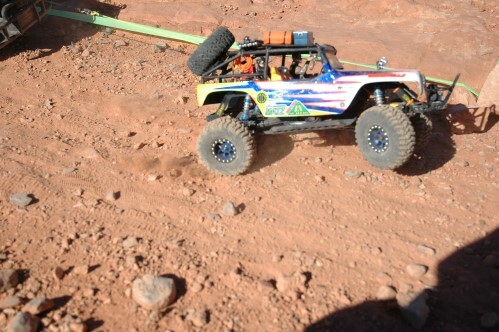 This Colorado Axial 1.9 Wraith helping out the Vegas hummer who took a wrong turn and ended up in the desert. Speaking of wrong turns, when you find yourself stuck or in place of needing some recovery help, some of you may turn to a buddy if one is nearby. Some of you may turn to the Pull Pal scale land anchor. Pictured below is Max of Pull Pal, who makes this very product. 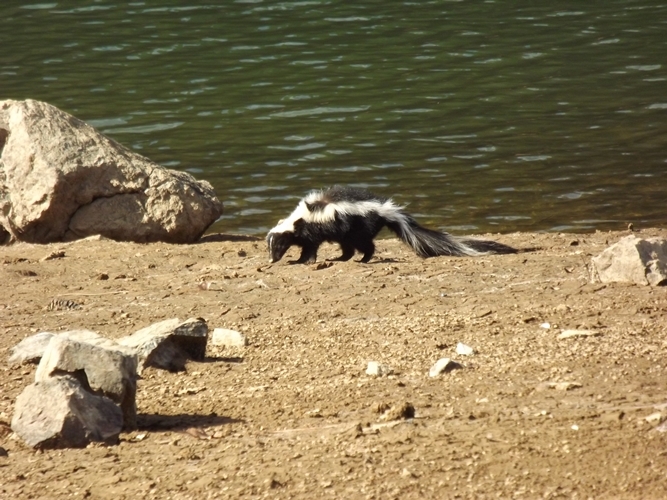 You never know who you will see on the trail. You may be surprised, like Tatum here. 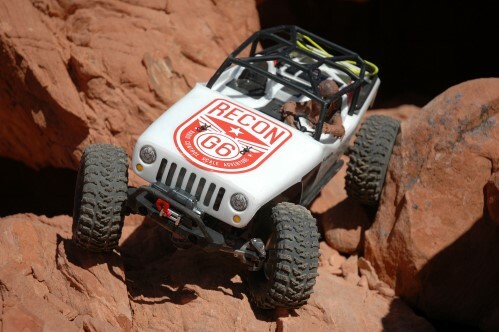 At an Axial RECON G6 you may see just about anything or anyone who lives the adventure lifestyle. 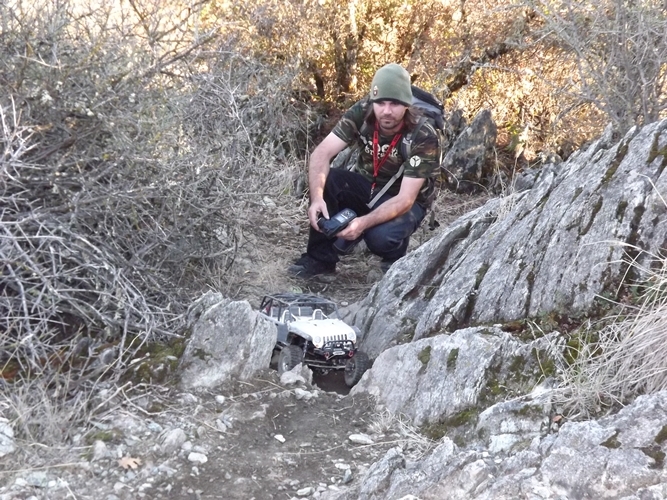 You may see someone pull some insane line. 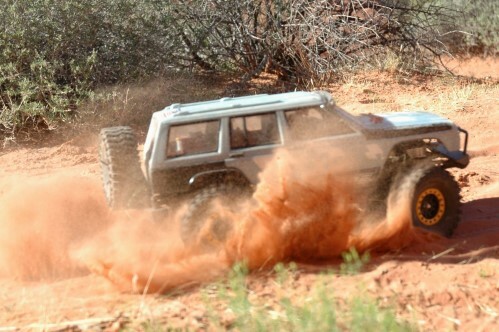 You may see some Jeep screaming down a dusty road. 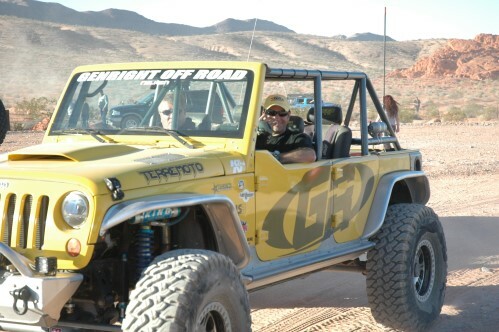 You may even see the Terremoto Jeep with off-road race driver Tony Pelligrino behind the wheel. 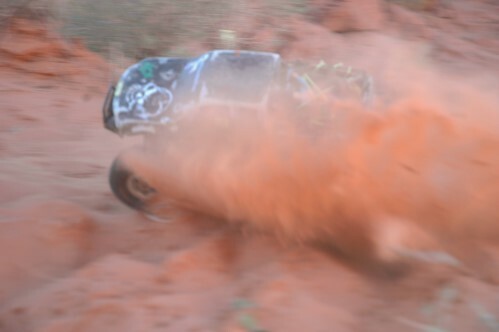 On an endurance course you could see the same sand over and over again! 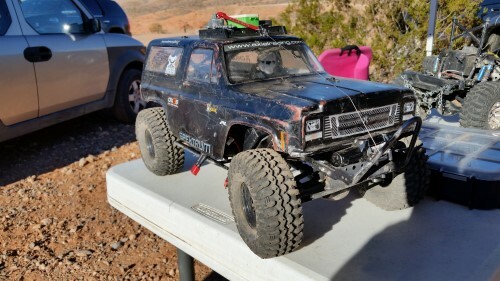 I spotted this Axial DeadBolt and what drew me in is how worn the tires are. 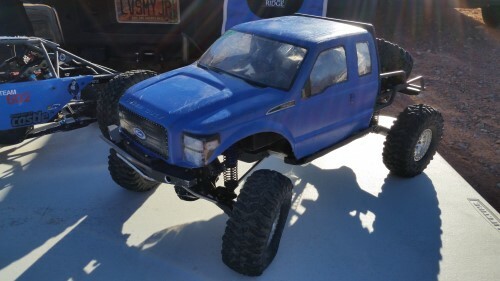 In talking to the owner Mike Thompson of Utah I learned this is an RTR with 129 miles on it. I asked how he knows it has 129 miles. Well he runs two GPS units on it every time he runs it. The only part he has had to upgrade is steering. 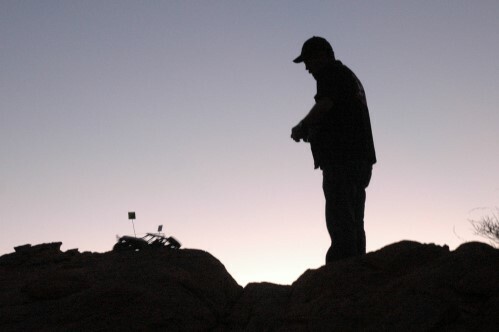 Everyone is giving their all until night falls. 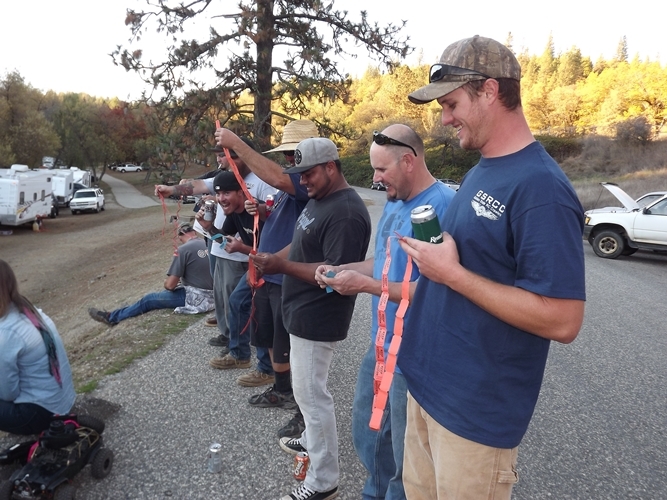 Some G6′ers were pushed to the point of equipment failure and some were able to just kick back and cheer these guys on. 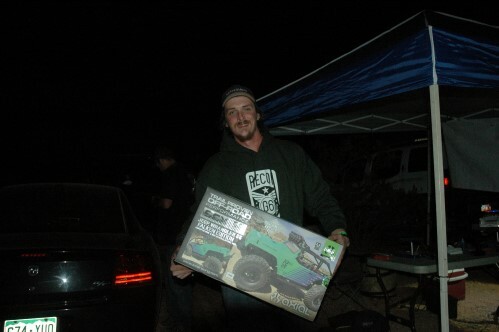 Some walked away winners at the raffle, like Daniel Soash from Azusa California pictured below. 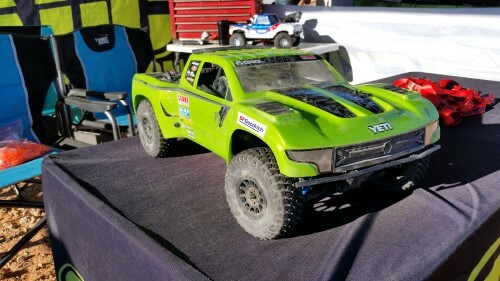 Or Frank Barrett here pictured below, both taking home Axial Falken G6 RTRs. Pictured below is Shawn Barton of South Carolina. It looks like these guys are all hooked together. 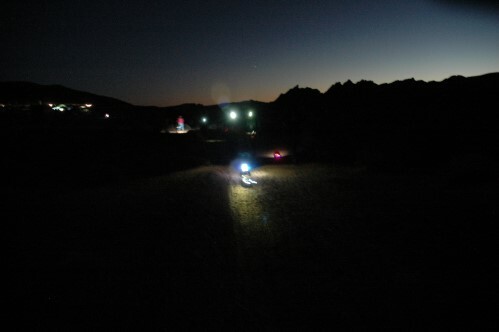 It has been a long day for some of these drivers, as the night closes in the lights begin to really shine. 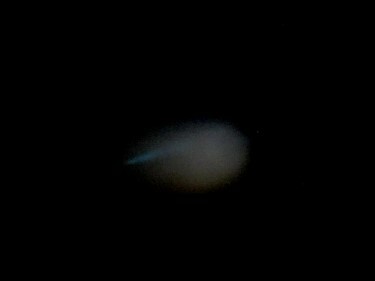 Some are almost alien like. 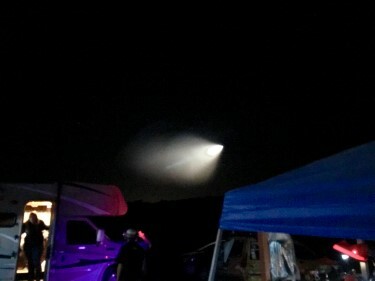 Speaking of alien like, on this particular night there was a bright light seen across the sky. 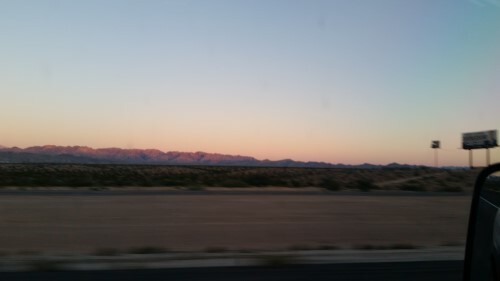 This was seen all over the western part of the US. 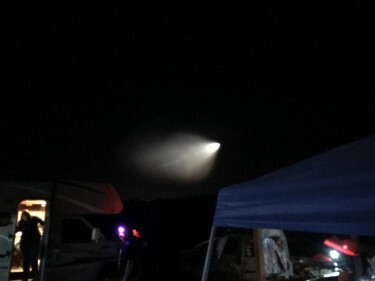 News channels reported it, with some saying it was a missile from a submarine off the coast of California.  Here are some pics of what our group saw. Makes you wonder right? Well that’s all until the next adventure! 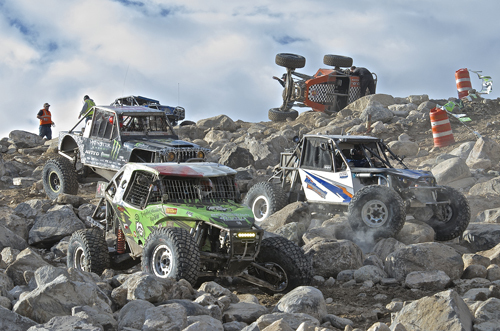 When it comes to racing, I cannot think of anything quite as exciting as an Ultra4 Race! 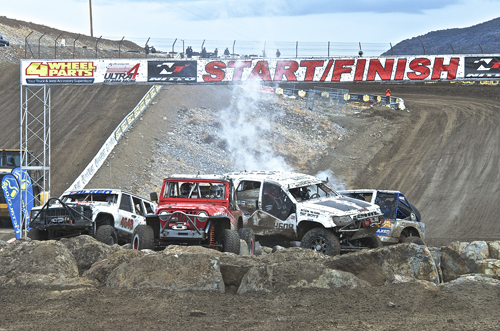 The National Championship held here in Reno at the Wildwest Motorsports Park last weekend once again pulled off one heck of a show! 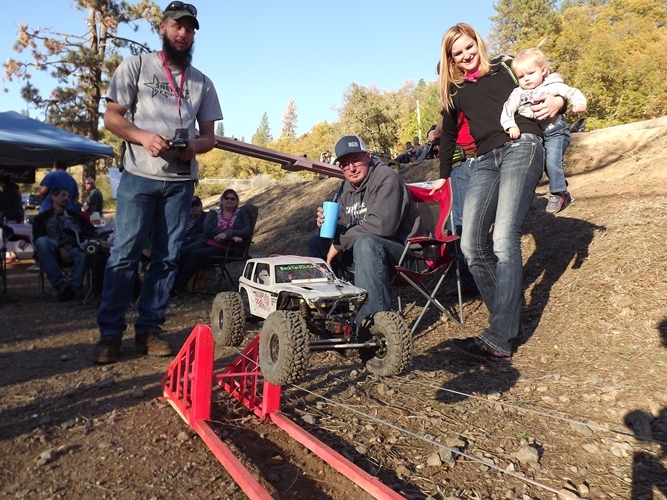 This racetrack and venue has quickly become a racer’s favorite. 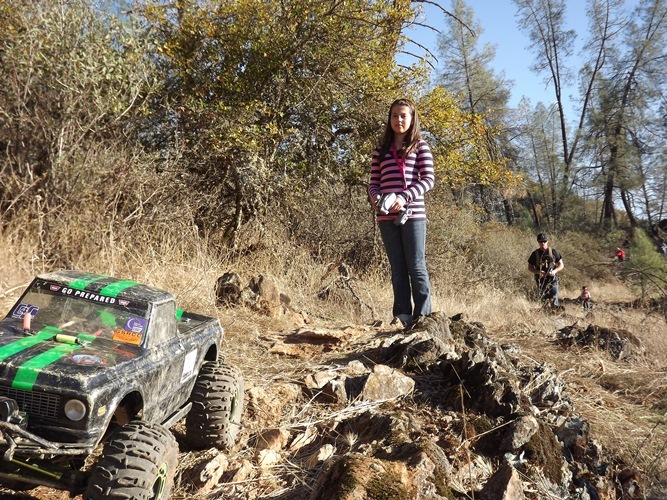 With the addition of rock sections compared to the traditional short courses, it adds an element that suits Ultra4 racing perfectly. 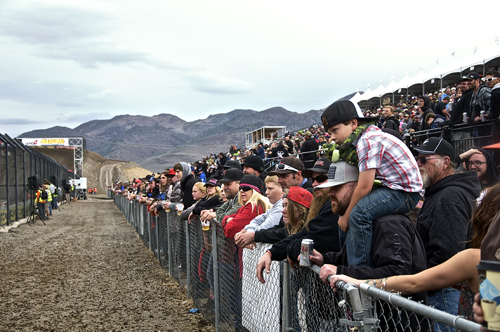 The fact that ninety percent of the course is within the view of the grandstands, has proven to be what it takes to draw in a large number of fans. Even with the steady rainfall throughout most of Saturday, by the time the main event started almost every seat was taken! 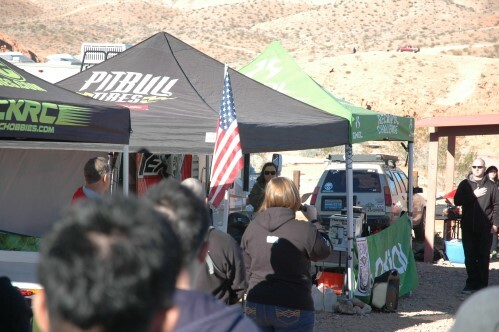 Dave Cole, the owner and president of the Ultra4, although being diagnosed with cancer earlier this year and still under going treatment, managed to show up to support this final race of the season. It sure was nice to see him back in his element where he belongs! 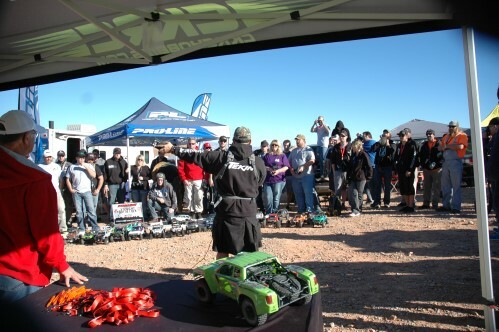 Over 120+ teams showed up for battle at this event. 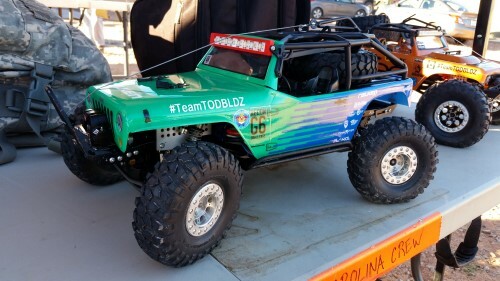 Roughly sixty 4400 teams showed up with one thing in mind… to beat Loren Healy and his Red Dragon! 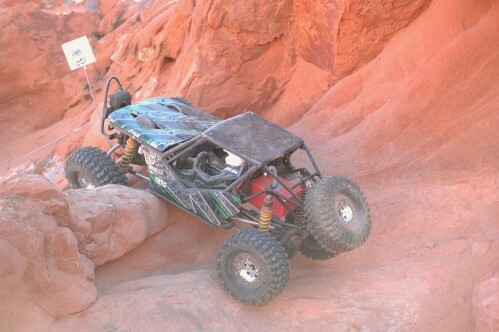 With the exception of this year’s King of the Hammers race where Loren had taken a violent roll at 90+mph and was unable to complete that race. 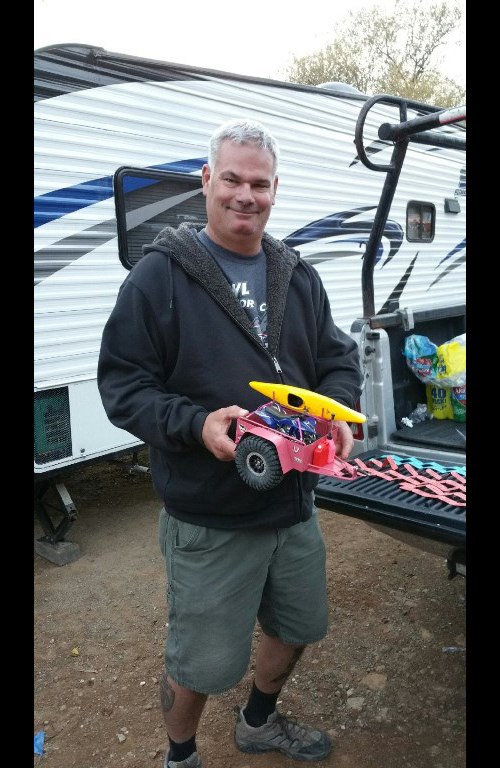 Loren has won every race he’s entered with his new car, “The Red Dragon.” This has forced teams to reevaluate their race cars and sink several thousands of dollars into them in order to try and keep up with him! 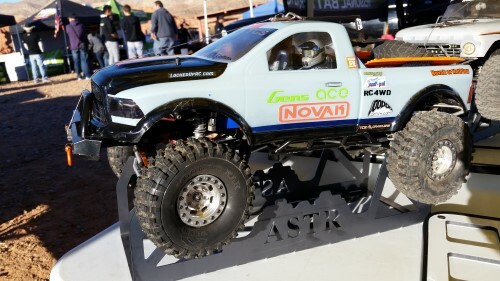 There was a lot of hype leading up to this event about a couple teams that had finished building their new cars, just so they could compete with Loren. 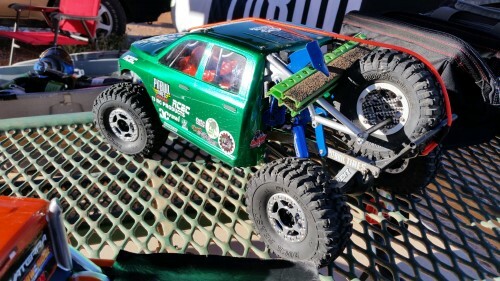 Shannon Campbell has built a car that is deemed “The Dragon Slayer!” The Gomez brothers also showed up with one of the two brand new IFS cars they are having built. 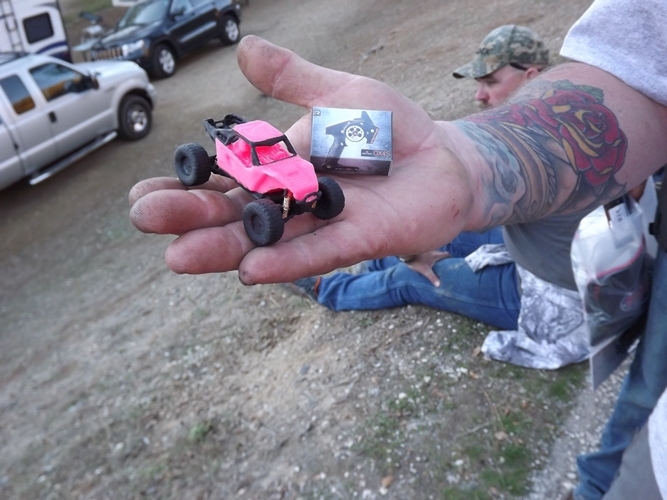 People were driving and flying in from all over the country to witness this showdown. 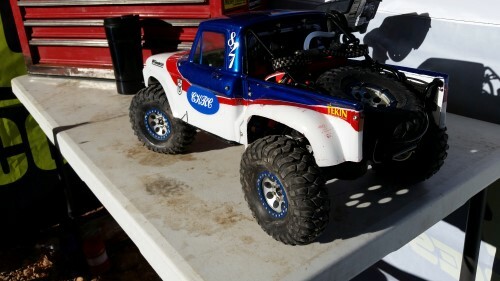 The teams spent most of the morning Friday practicing and pre-running the course preparing to qualify at 2:00pm. Mike Bou of Bou Racing had an unfortunate rollover early in practice that left him sidelined for the rest of the weekend. In qualifying, each driver would run one lap on a pre-selected course. The drivers with the fastest time to the slowest would then get sorted into two heat races, with the fastest drivers starting out front. After all the cars had qualified, Loren found himself sitting in sixth position. Gary Ferravanti Sr. had the fastest qualifying time for the day, followed by Shannon Campbell in his Dragon Slayer. The fact that Loren had finished sixth, one could not help but think about him getting beat finally? It may have been that he was one of the first to qualify and decided to make a more conservative run. 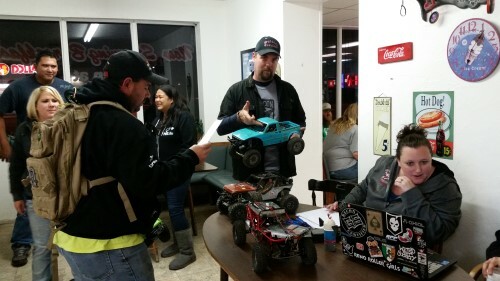 But nonetheless with Gary Ferravanti and Shannon Campbell sitting out front and along with three others in front of him, it left everyone anticipating how things were going to go on race day. 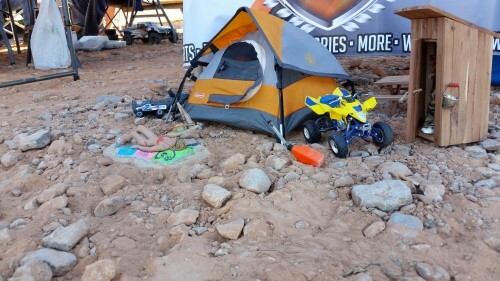 It began to rain Saturday morning while I walked around the pits wishing all the teams good luck. The rain was certainly going to add a whole new element to this race! 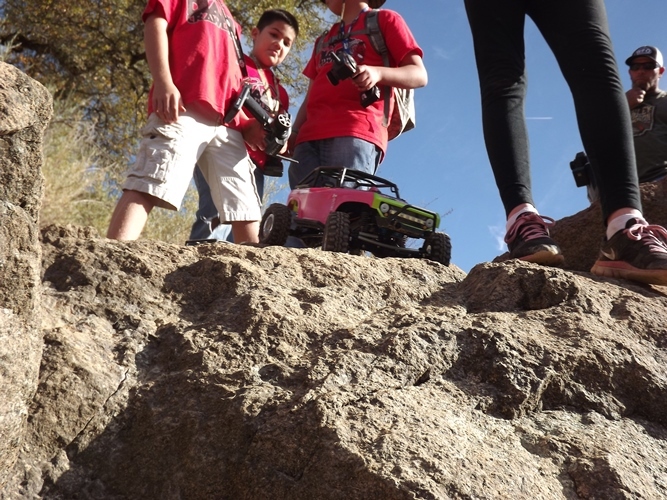 After watching the first three lower class prelims struggle to get through the lower rock section due to it being so slick. 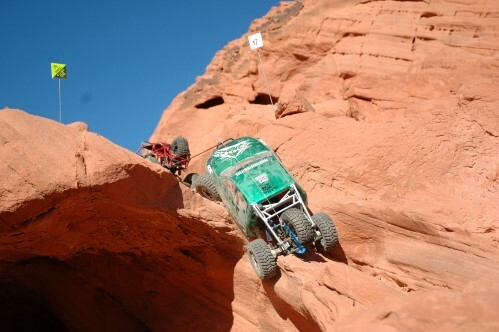 The decision was made that the 4400 class would be forced to come down the big rock section this year instead of racing up it as intended. 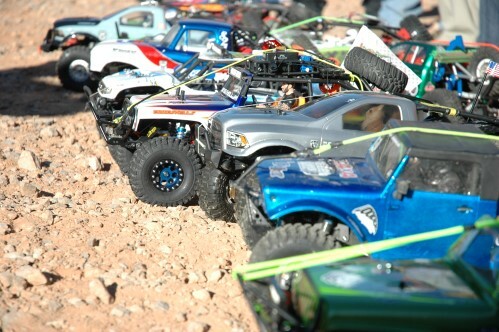 You could feel the tension as the racers lined up for this first heat race. Gary Ferravanti and Jason Scherer would start out front of the first heat race. 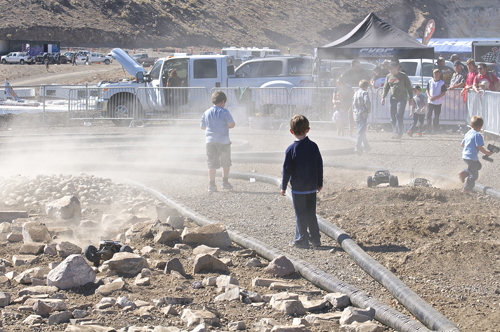 Without ever having had the opportunity to pre-run the course since the decision was made to have them run down the rock pile. 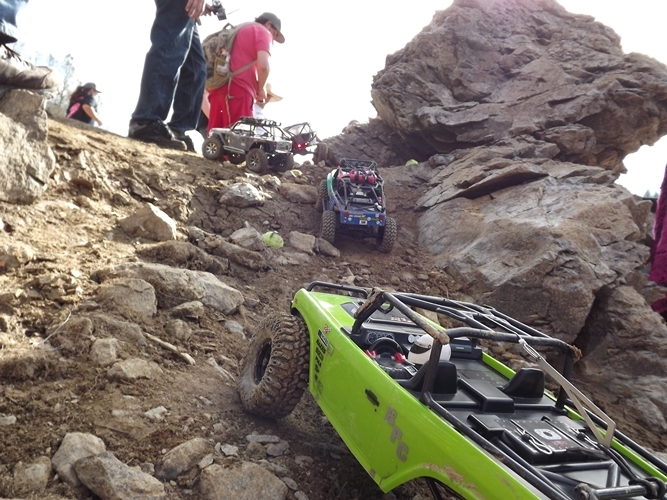 Gary made a wrong turn coming out of the rock pile with Jason following right behind him allowing a couple of racers to get around them. They both were able to get back on course and after a couple of scuffs with other drivers, which left Paul Horschel on his side in the rocks. Gary was able to take the lead back then went on to win heat one. Heat two would start out with Shannon Campbell and Levi Shirley on the front row. After the green flag dropped, it didn’t take Loren but couple of laps to take over the lead. He was able to maintain that lead until the final lap, when Clay Gilstrap was able to make a pass on him at the bottom of the rock pile and went on to take the checkered flag. There was a controversy over weather or not Clay had made the pass under yellow flag conditions and I wasn’t sure if it that would make much of a difference as long as they both gained their spot in the main event. However, it would definitely effect where they would line up for the main. 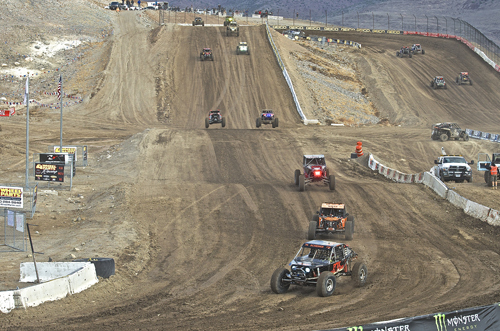 The top ten drivers from each prelim moved on to the main event. The remaining drivers that hadn’t made the main event would have one more shot in the LCQ (last chance qualifier), where the the top five drivers would move on to the main event. 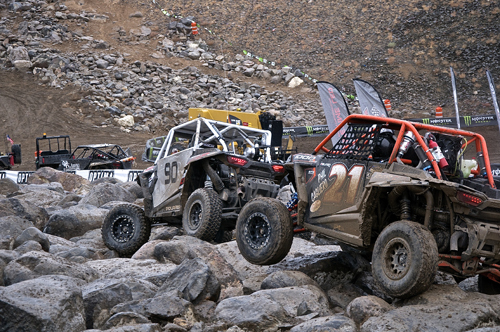 The UTV main was up next, with the rain still coming down it made the rock sections very tough on these drivers. In fact, it was so difficult that not one driver was able to complete the entire eight laps. 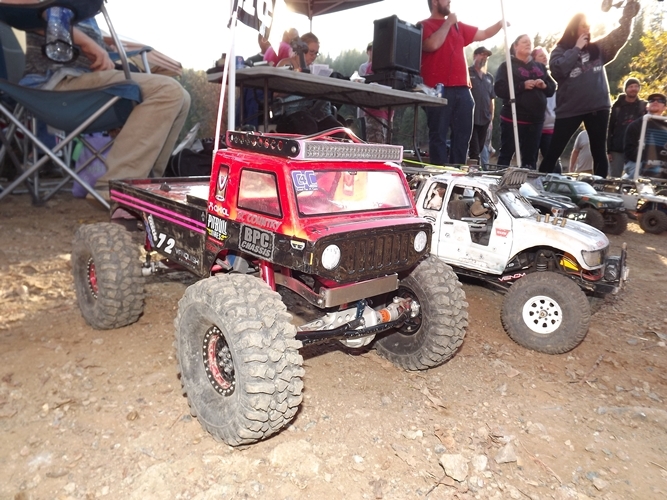 Phil Cagliero of the sportsman class would make it the furthest, completing seven and three quarter laps before coming to a stop after losing his transmission. 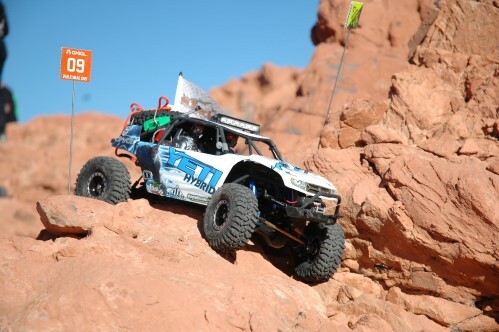 Andrew Gorman of the pro class was forced to come to a stop shortly behind Phil after breaking a steering link and was unable to keep moving. Both would end up taking the win for their classes for successfully completing the most laps. 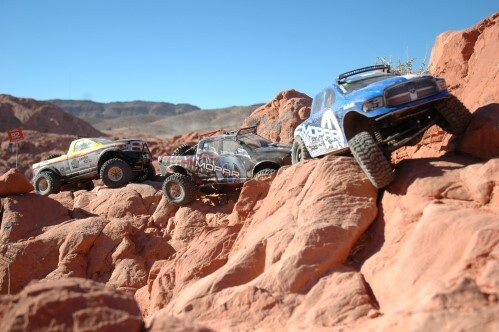 A couple of drivers ended up stuck in the rocks for the entire race! 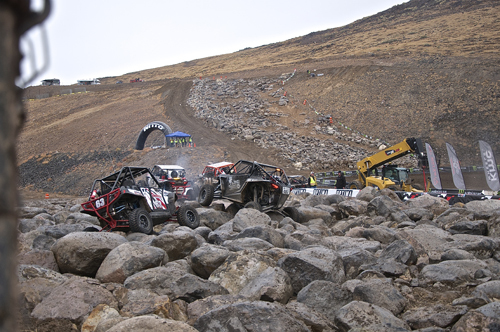 After some track maintenance and a short lunch break , the LCQ (last chance qualifier) was ran first so they could establish the field for the 4400 class main event. 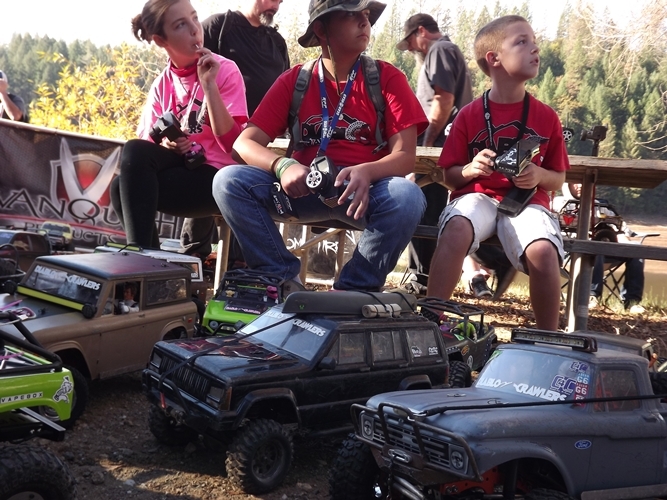 The Stock/Mod class main was up next and they would not disappoint! 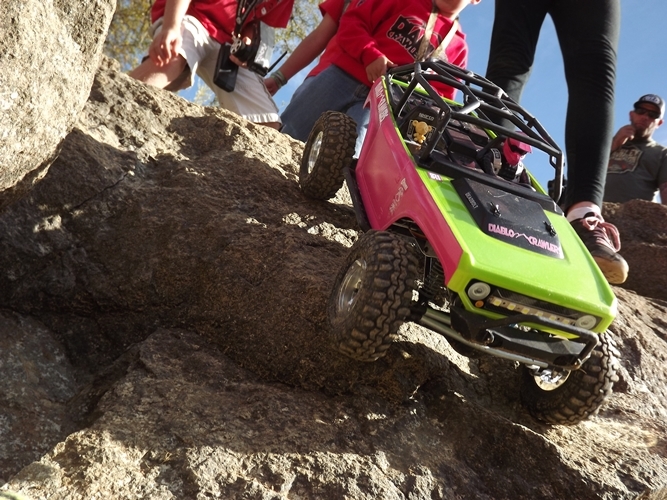 There were a couple of rollovers along with some exciting passes going on in the rock sections! 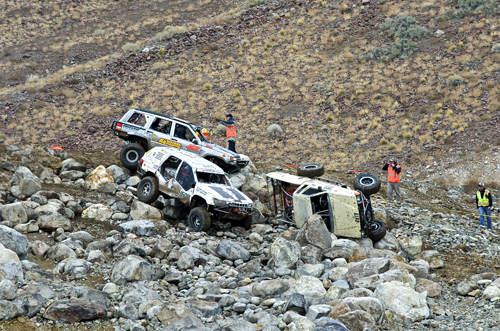 In this class these drivers must have the skills needed for choosing the proper line through the rocks. 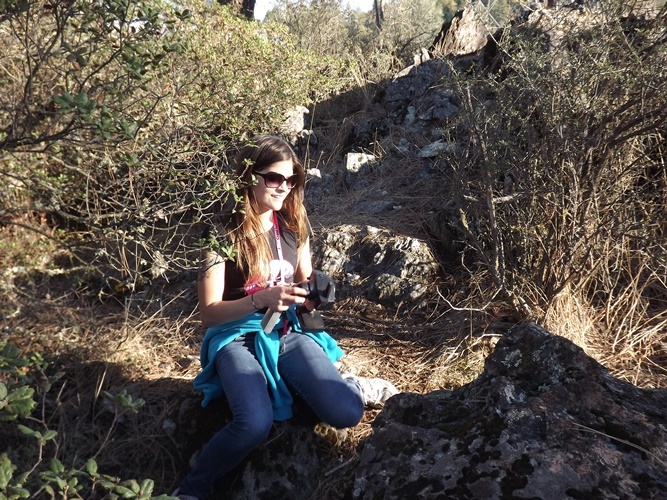 If not, they could quickly find themselves on their sides or hung up in the rocks. After a hard fought battle and some impressive driving, Matthew Peterson took home the win with Brian Behrend coming in second. 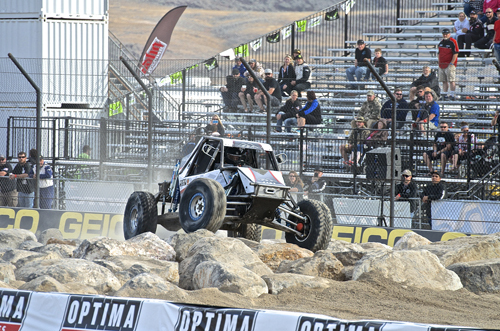 Followed by Justin Reece finishing in third place to round off the podium. 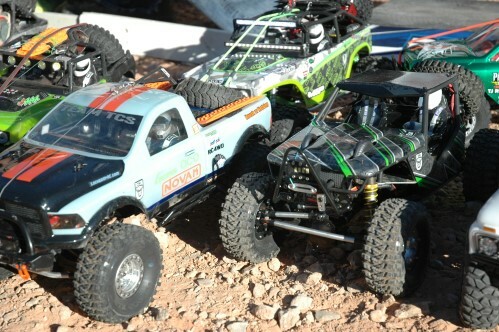 Up next would be a combination of cars from the 4500 class, the 4700 spec class, and the 4800 legends classes. This race is always fun to watch, these vehicles are very fast considering the lack of suspension compared to the unlimited class. 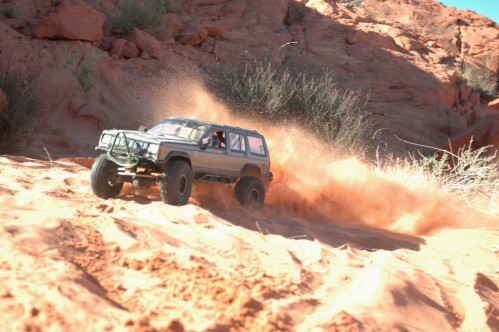 Unlike all the other classes, these vehicles actually run the same course as the unlimited class. I gained a lot of interest in this class ever since the day I overheard Dave Cole state to one of the drivers, “there is no way a legends car would ever beat his spec cars!” I have witnessed legend driver Rick Waterbury come very close to winning the overall in this class, only to have something break preventing him from do so. It may be because theoretically the car shouldn’t be able to take the same amount of abuse as one of Dave’s spec cars? I personally think it will be just a matter of time before Rick is able to beat them spec cars. He is consistently running up front but has not yet been able to win the overall. 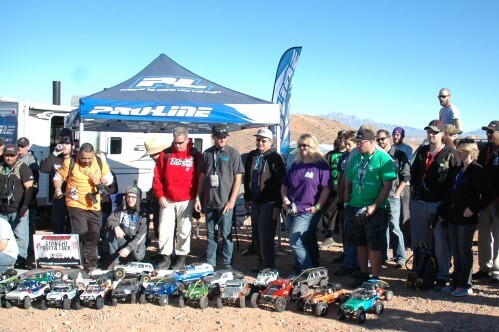 It is hard for me to root for just one driver in this class, it is stacked with talent and a whole lot of good people. 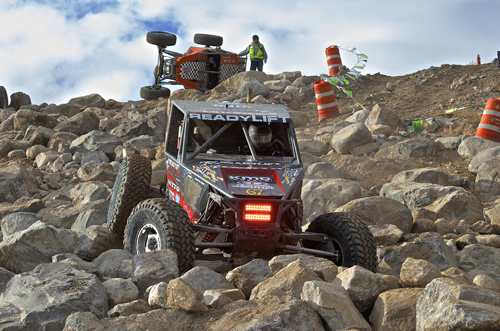 It was fun watching Justin Hall who had transitioned from rock crawling to the Ultra4 series last year pull off this win in the 4500 class. 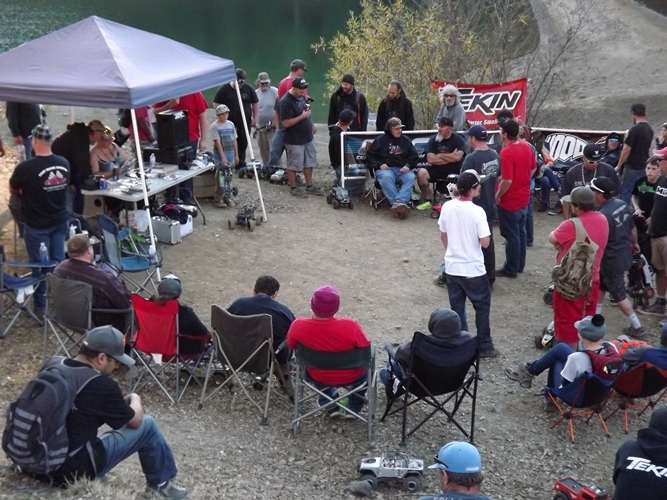 Shawn Rants came in second, and Steven Lopez finished third even after flopping his rig on its side in the rocks. 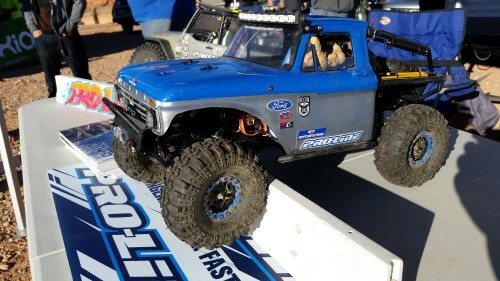 In the 4800 legends class it was Anthony Arreola once again bringing home the win. 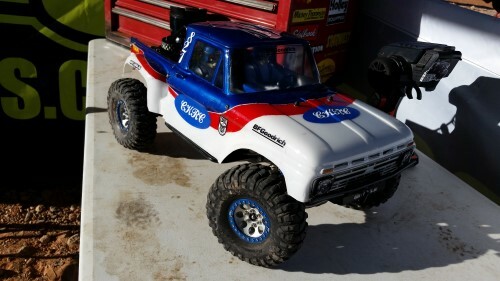 Anthony has won four out four races in this car since purchasing it from Ben Napier. 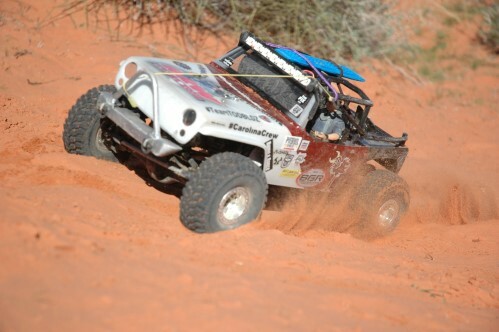 Dave Schneider came in second just tenths of a second behind Anthony, followed by Mike Amaral finishing in third. 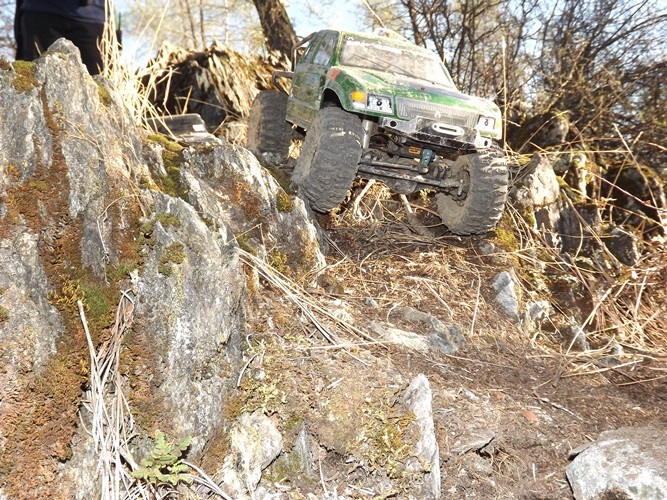 In the 4700 spec class, it was Ricky Johnson who once again came out on top. Larry Nickell came in second, with Bailey Cole finishing in third. Next, it was time for the big show..the 4400 unlimited class! While they took the time to do some track maintenance, they started their driver introductions after the introductions and the national anthem was sung. They allowed Ferravanti Jr. as much time as they could to get his alternator changed out before the start of the race. 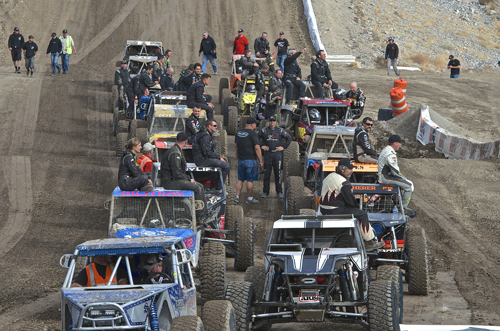 The drivers started their parade lap up around the top of the mountain to line up for a rolling start through the rocks right in front of the stands. 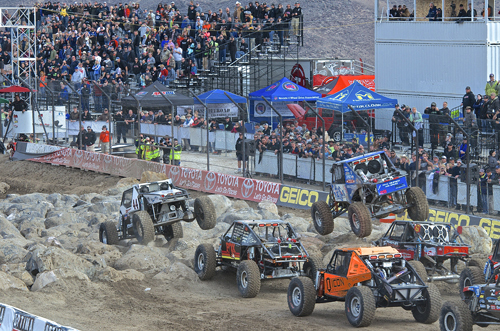 With the fans on their feet cheering these guys, the drivers battled their way through those rocks showing exactly what their cars were capable of. 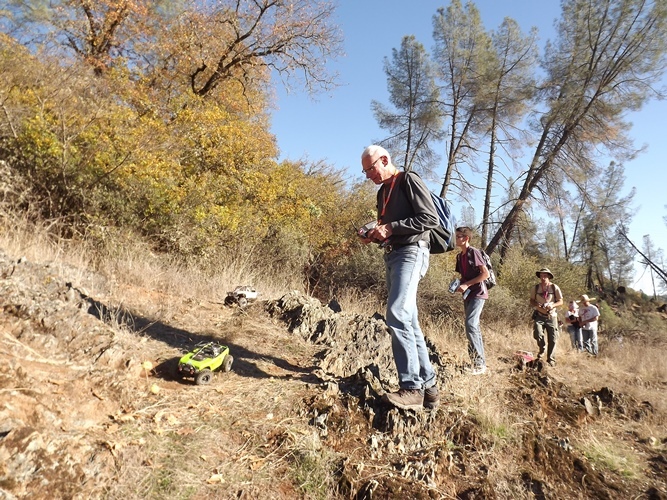 Gary Ferravanti was the first through the rocks with Clay Gilstrap behind him, and Tom Wayes and Loren Healy not far behind. It was Gary and Clay battling out front that had the crowds attention and Clay made a pass on Gary coming down the mountain. I’ve watched Gary race enough to know he would be looking for any opportunity to get back to the front! 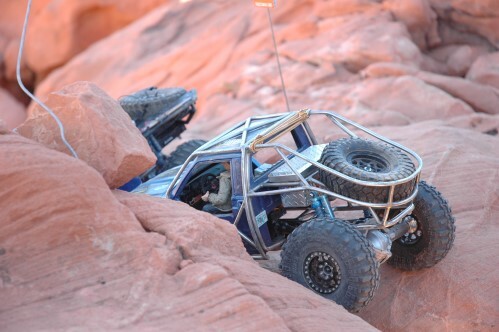 You could tell by the way he drove into the rock pile that he wanted the lead back now! 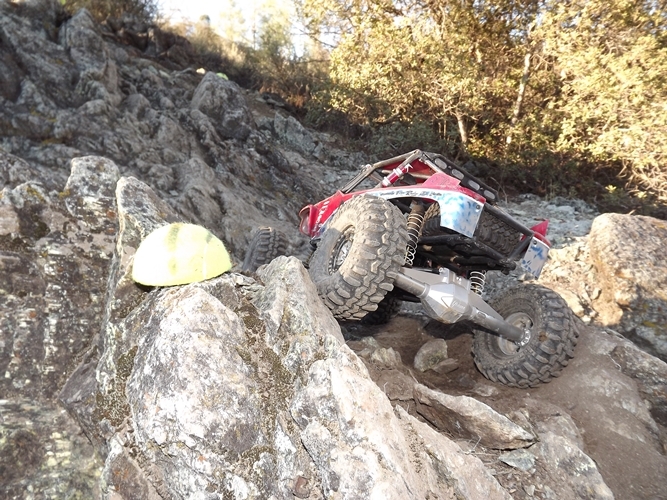 That aggression was short lived when his alternator exploded coming down the rock pile, shorting out the entire car, forcing him to come to a stop at the bottom of the rocks. 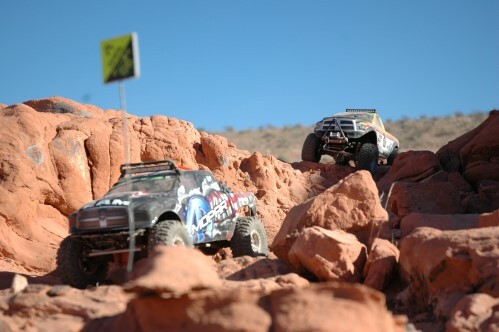 Clay was able to get out to a sizable lead while Loren was battling with Tom. 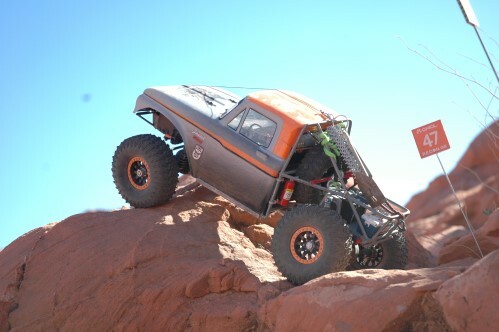 Loren had just made an aggressive pass on Tom heading into Metalcloak mountain when Tom’s alternator quit, forcing him to pull over. With no other cars in his way now, it didn’t take Loren long to catch up and make the pass on Clay for the lead. 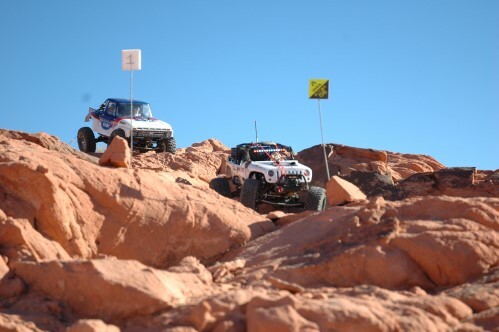 Jason Scherer had been gaining ground on both Loren and Clay while they were battling. 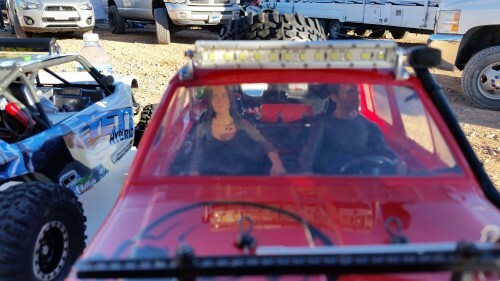 After catching up to Clay, it took Jason almost a lap to find a place where he could get around him! By that time Loren had got himself out to a comfortable lead. Once he started to run into lap traffic it gave Jason the opportunity close the gap on him. He was quickly running out of time as Loren was able to get around them taking the white flag. With only one lap left and being held up by the slower traffic himself, it began to appear Loren and Jason would finish first and second respectively unless something crazy happened. 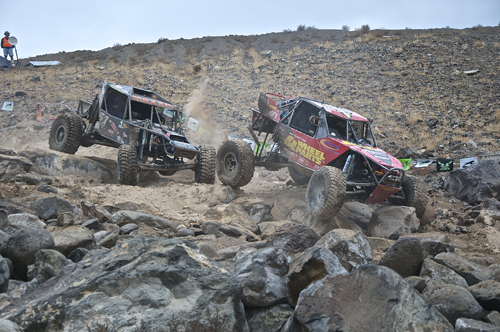 The real battle going on was directly behind them for third place between Clay Gilstrap and Erik Miller! 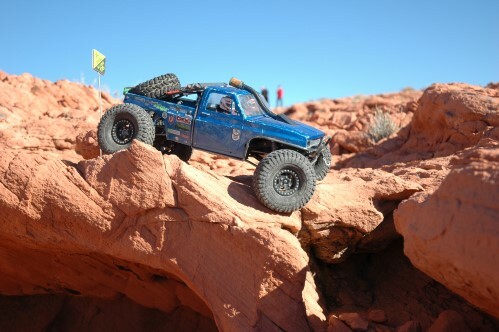 Erik had been driving the wheels of his solid axle car making his way to the back of Clay, when finally going down the rocks, Clay made a mistake and fell off the course, allowing Erik to get around him before the bottom of the rock pile. Loren had taken the checkered flag with Jason not far behind as Erik made that pass on Clay. 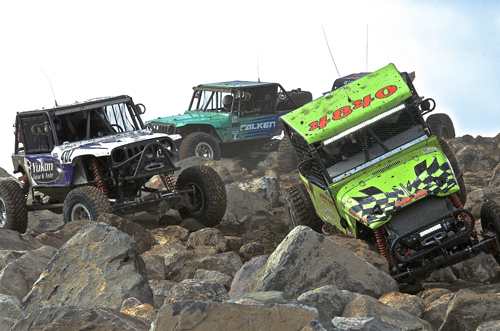 With one turn left and lap traffic still making their way through the rocks, without lifting at all they both went for a wild ride skipping across the rocks when Erik was able to get around one of the slower cars as he slid across the finish line completely sideways! 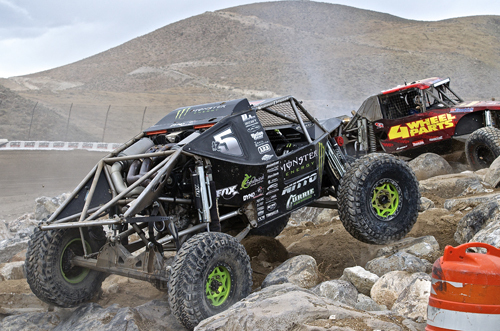 What an incredible race, it was a perfect ending to another season of Ultra4 racing! Congrats to Loren for handling all the pressure leading up to this race like the champ that he is..No Dragons were slain that weekend! 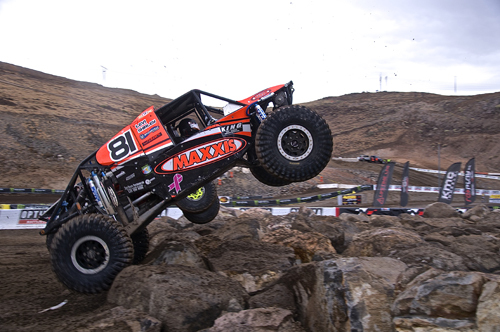 Loren has won the West Coast Championship and now the National Championship Race for the second year in a row. Congrats to Jason Scherer on his second place finish, I think he might of had a shot at Loren if there would of been a couple of more laps. 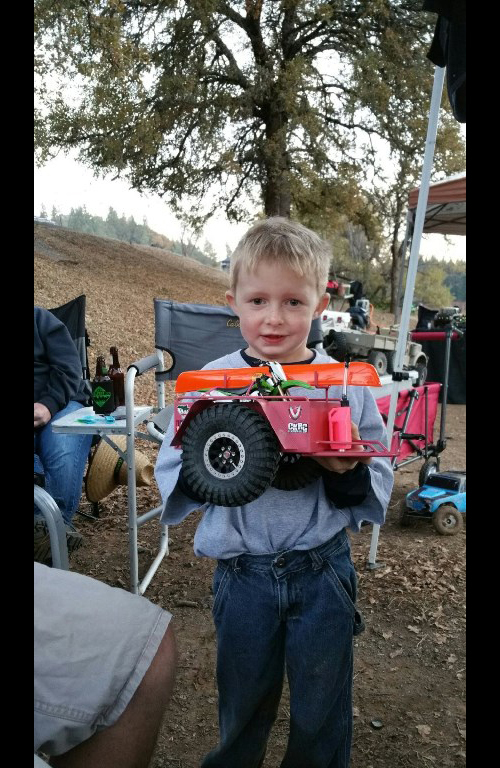 A huge congrats is in order for Erik Miller who drove the wheels off his solid axle car finishing in third place in a stacked field of IFS cars. Worth mentioning was watching JP Gomez come from the rear of the pack to finish in eighth place in his brand new IFS car. The car was finished with just a few hours to spare before showing up to the track. Congrats you guys on your finish! 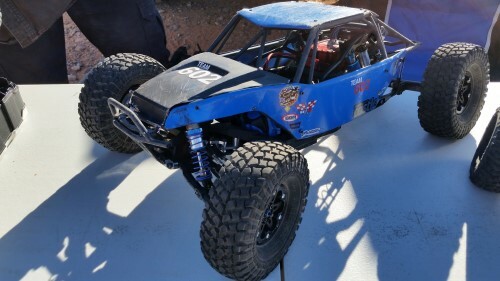 They will be finishing their other twin car for his brother Raul soon, and the plan is to have them both ready for battle at the King of the Hammers…Best wishes to you all! 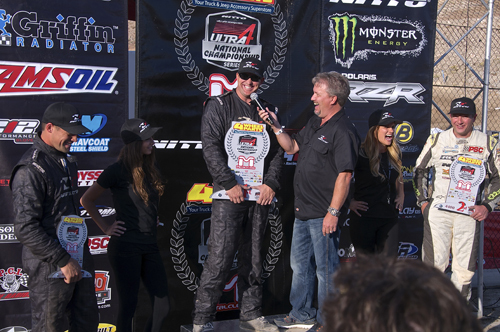 Congrats to Nitto Tire on another podium sweep. 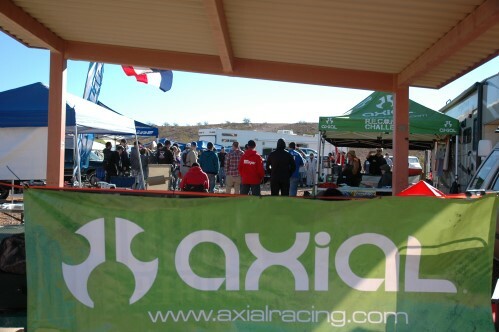 Thanks for all of your continued support you give to help allow these races to happen. 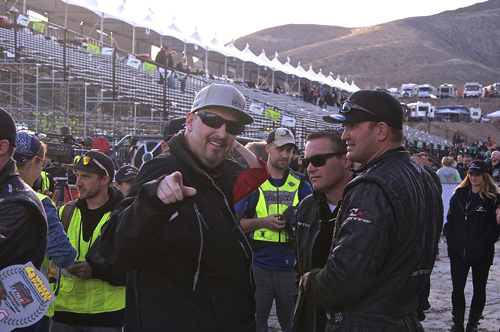 I hope to see all of you and more at the King of the Hammers 2016…. For the perfect ending to another season, over five hundred people involved in or around this sport showed up for the awards banquet held at the Atlantis Casino. I can’t even begin to explain how proud I felt to be around some of the nicest and caring people I know all in one place. 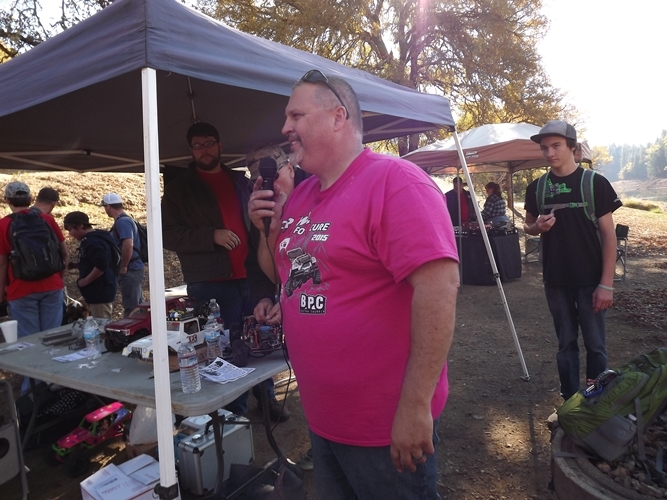 It was humbling watching Dave Cole hang out as long as he did so he handed out the awards and the thank you’s himself. 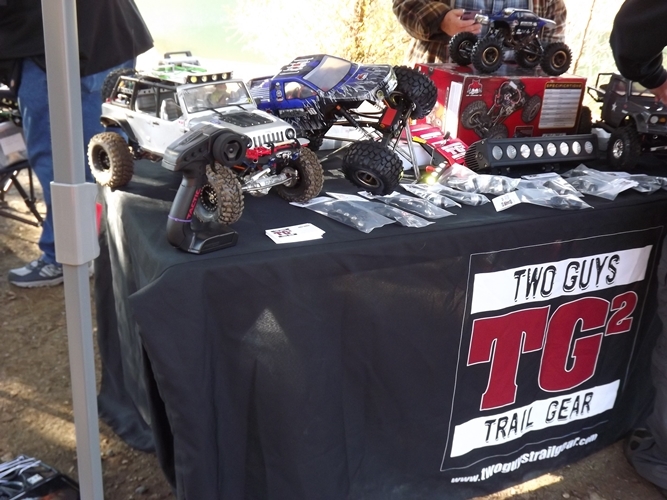 I would like to thank JT Taylor and the whole Ultra4 staff and all the volunteers who stepped up for Dave to help this series continue to run smoothly for the rest of the season. Congrats to Derek West and Loren Healy on your East and West Coast Championships. Congrats to Levi Shirley on your well deserved National Championship Season! And a huge congrats to the Campbells and their whole team for having all three of their cars finishing in the top ten in the National Standings for the season, not an easy task by no means..great job you guys! 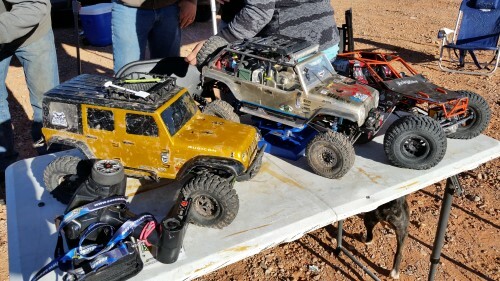 Thanks to all of you that race in this awesome series for always keeping me entertained and allowing me to be part of this incredible Ultra4 family. 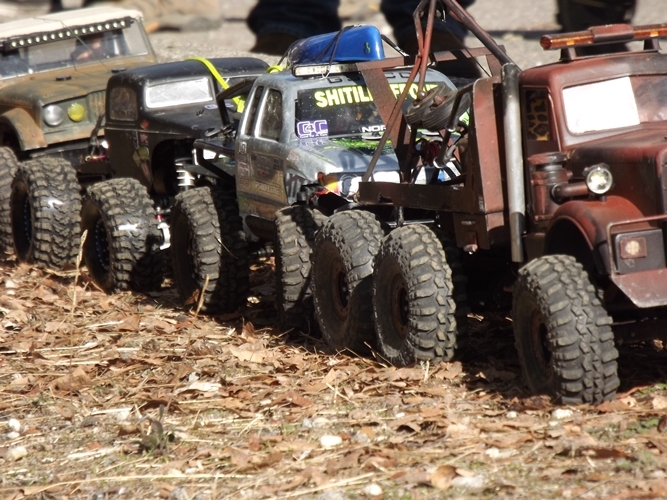 Thanks CKRC for bringing out the Axial Yeti’s to entertain the little ones! 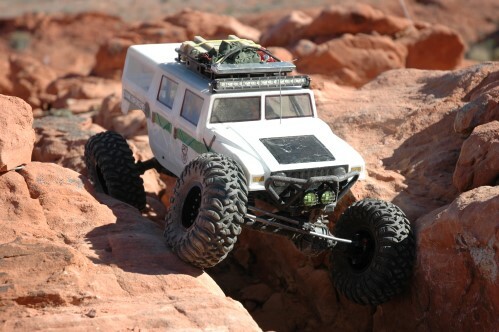 Far to often, questions about the differences between each of the SCX10 vehicles arise, especially surrounding wheelbase and body options. 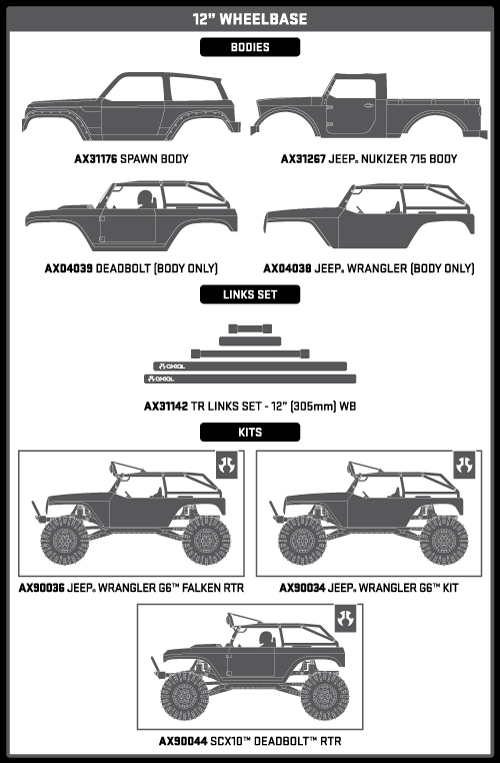 Questions such as “is this body compatible with that chassis?” or “which link kit should I order?” and so on. 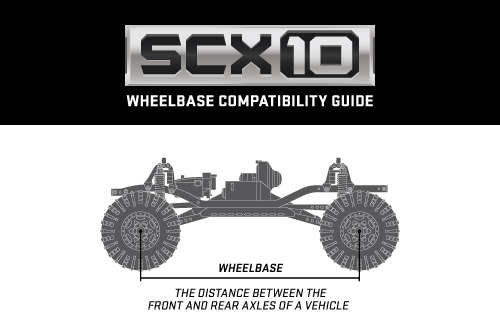 The beauty behind the SCX10 is its ability to change wheelbase lengths with relative ease, which also makes it possible to choose from a larger array of bodies thanks to this adjustability. All great news but what does it mean? 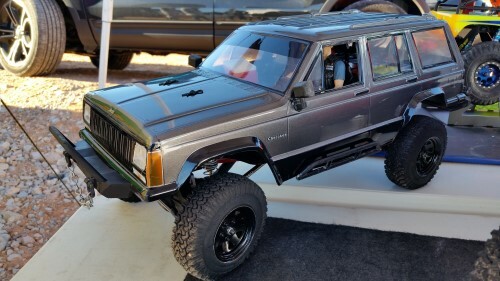 Simple, say for example you purchased a Ram Power Wagon RTR (AX90037) but you really want to paint and build up a Jeep Mighty FC Body (AX31268), install the 11.4” TR Links Set (AX30549) to shorten the wheelbase and your ready to go. 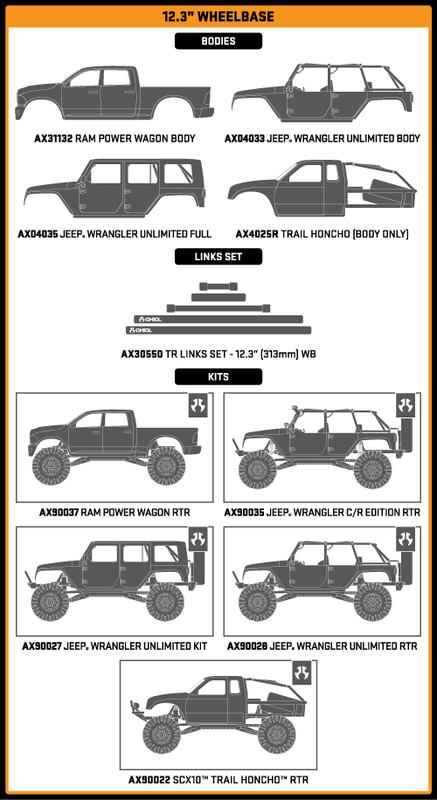 Or going the opposite direction, you’ve got a Dingo (AX90021) and want to build up a Jeep Wrangler Unlimited Full body kit (AX04035), just install the 12.3” TR Links Set (AX30550). 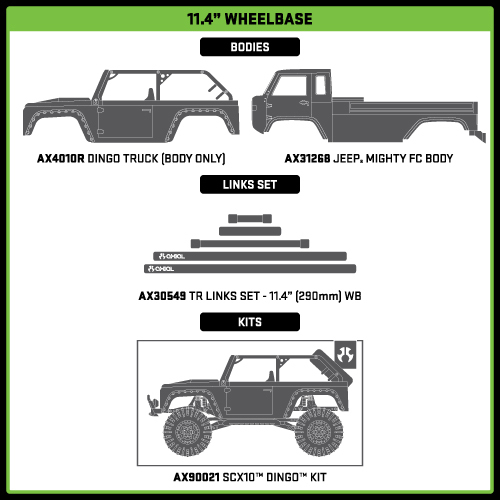 At the end of the day, the link kits are your gateway to multiple body options for the perfect look with wheels tucked attractively into the wheel wells. 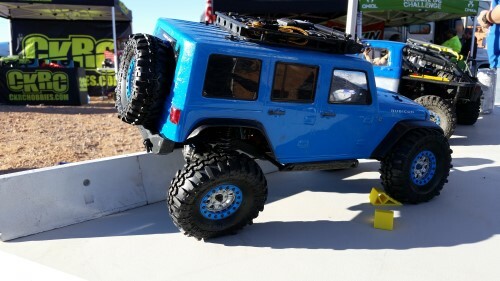 From a tune-ability standpoint changing the length of your vehicles wheelbase will change it’s driving characteristics. 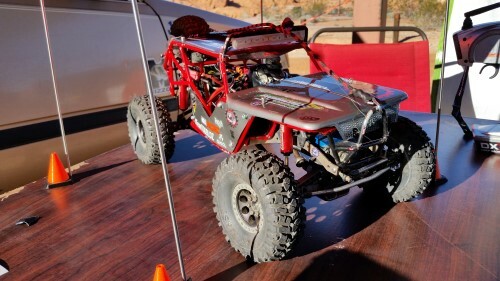 For example, the shorter 11.4” wheelbase will increase slow speed maneuverability while sacrificing some high-speed stability, great for tight technical terrain. 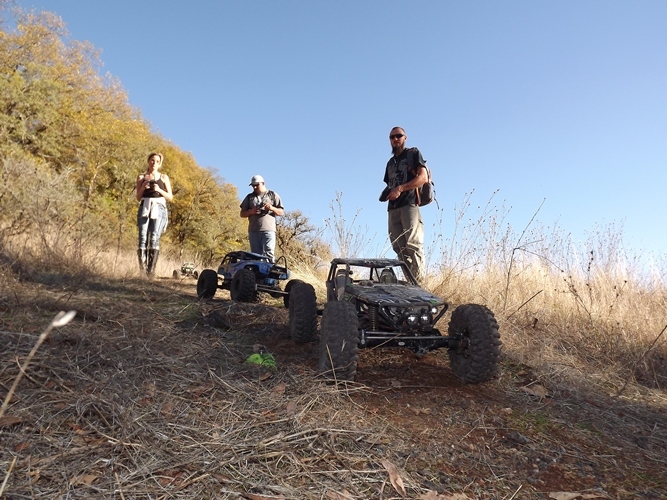 While a longer 12.3” wheelbase will improve stability and decrease maneuverability, great for hill climbing. 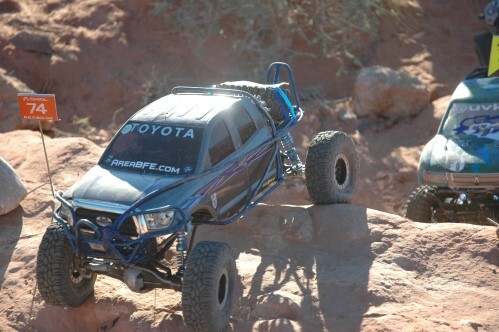 Tech Terms: Wheelbase – The distance between the center points of the front and rear axles on a vehicle. 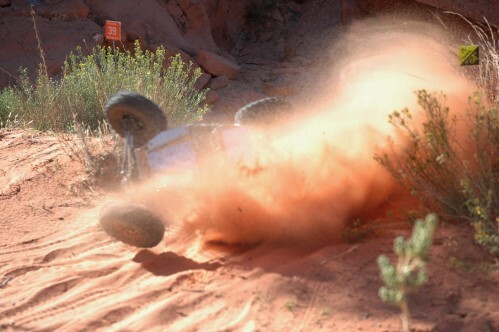 Maneuverability – Able to be maneuvered easily while in motion. Stability – Resistance to change, especially sudden change.